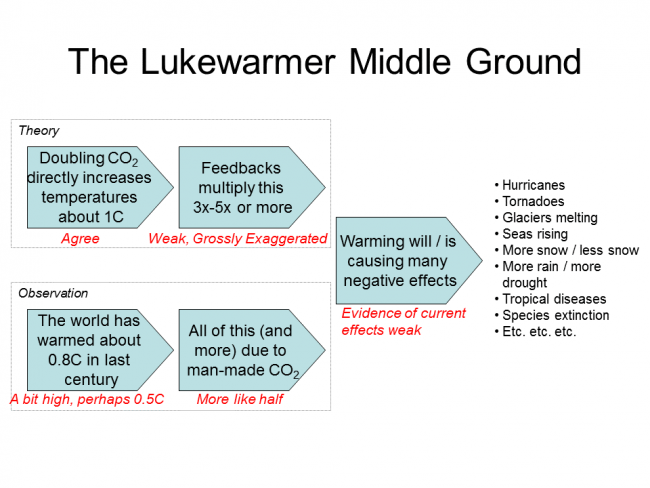 In this chapter we are going to try to sum up where we are and return to our very first chapter, when I said that we would find something odd once we returned to the supposed global warming "consensus". The statements I just wrote above, no matter how reasonable, are enough to get me and many others vilified as "deniers". You might think that I am exaggerating -- that the denier tag is saved for folks who absolutely deny any warming effect of CO2. But that is not the case, I can assure you from long personal experience. Of course, the very act of attempting to shut people up who disagree with one's position on a scientific issue is, I would have thought, obviously anti-science. The history of science is strewn with examples of the majority being totally wrong. Even into the 1960's, for example, the 97% consensus in geology was that the continents don't move and that the few scientists who advocated for plate tectonics theory were crackpots. But that is not how things work today. Climate action advocates routinely look for ways to silence climate skeptics, up to and including seeking to prosecute these climate heretics and try to throw them in jail. The reason that alarmists say they feel confident in vilifying and attempting to silence folks like myself is because they claim that the science is settled, that 97% of climate scientists believe in the consensus, and so everyone who is not on board with the consensus needs to shut up. But what exactly is this consensus? 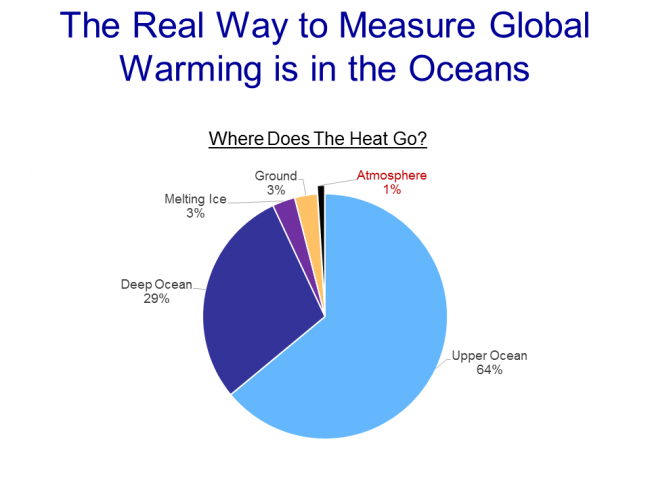 The 97% number first appeared in a "study" by several academics who sent out a survey to scientists with some climate change questions. 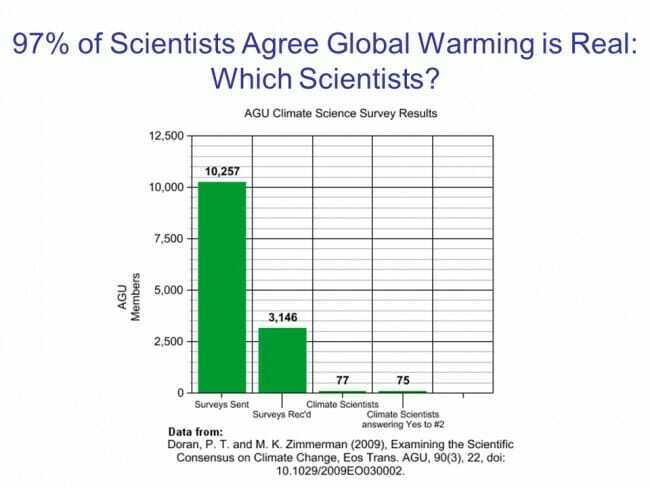 They recieved over 3146 responses, but they decided that only 77 of these respondents "counted" as climate scientists, and of these 75 of the 77 (97%) answered two questions about climate change in the affirmative. We will get to the two questions in a second, but note already the odd study methodology. If the other 10,000 plus people sent the survey were not the targets of the survey, why were they sent a survey in the first place? It makes one suspicious that the study methodology was changed mid-stream to get the answer they wanted. When compared with pre-1800s levels, do you think that mean global temperatures have generally risen, fallen, or remained relatively constant? Do you think human activity is a significant contributing factor in changing mean global temperatures? The 97% in this survey answered the questions "risen" and "yes". Do you see the irony here? If you have been following along with this series, you should be able to say how I would have answered the two questions. I would certainly have said "risen" to 1. The answer to question 2 is a bit hard because "significant" is not defined, but in a complex system with literally thousands of variables, I would have said one of those variables was a significant contributor at anything over about 10%. 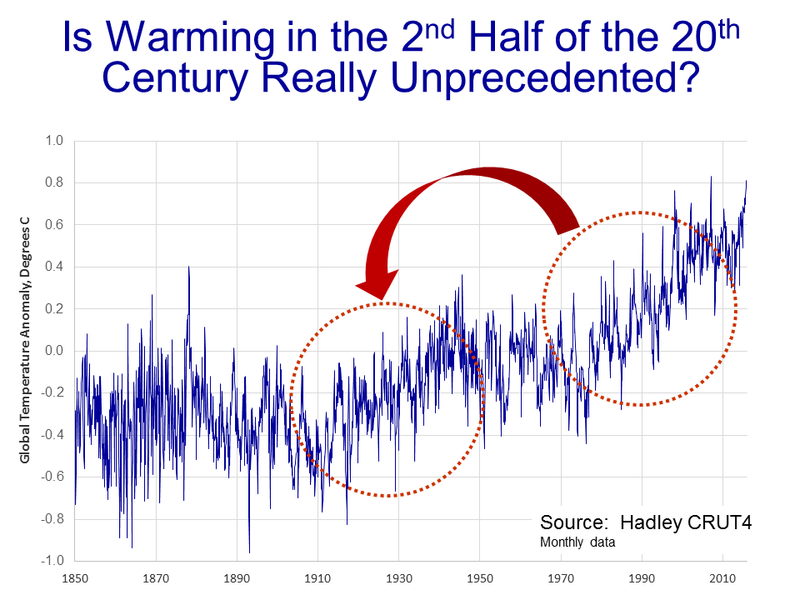 Since I estimated man's effect on past warming around 40-50%, I would have answered "yes" to #2! In fact, most every prominent science-based skeptic I can think of would likely have answered the same. So you heard it right -- I and many prominent skeptics are part of the 97% consensus. Effectively, I am being told to shut up and not continue to say what I think, in the name of a 97% consensus that represents exactly what I am saying. This is so weird as to be almost Kafka-esque. This is what I call the climate bait and switch. Shaky assumptions about things like high positive feedback assumptions are defended with the near-certainty that surrounds unrelated proposition such as the operation of the greenhouse gas effect. 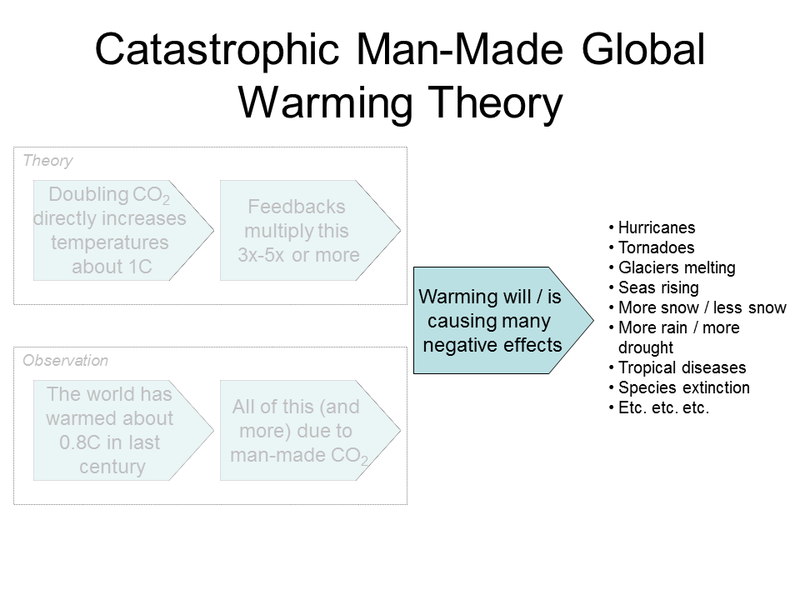 Is manmade CO2 causing catastrophic increases in warming and warming-driven weather effects whose costs exceed those of reducing CO2 production enough to avoid these effects? if an action or policy has a suspected risk of causing harm to the public, or to the environment, in the absence of scientific consensus (that the action or policy is not harmful), the burden of proof that it is not harmful falls on those taking an action that may or may not be a risk. The principle is used by policy makers to justify discretionary decisions in situations where there is the possibility of harm from making a certain decision (e.g. taking a particular course of action) when extensive scientific knowledge on the matter is lacking. The principle implies that there is a social responsibility to protect the public from exposure to harm, when scientific investigation has found a plausible risk. These protections can be relaxed only if further scientific findings emerge that provide sound evidence that no harm will result. I believe that, as stated, this is utter madness. I will give you an example. Consider a vaccine that saves thousands of lives a year. Let's say, as is typical of almost every vaccine, that it also hurts a few people, such that it may kill 1 person for every thousand it saves. 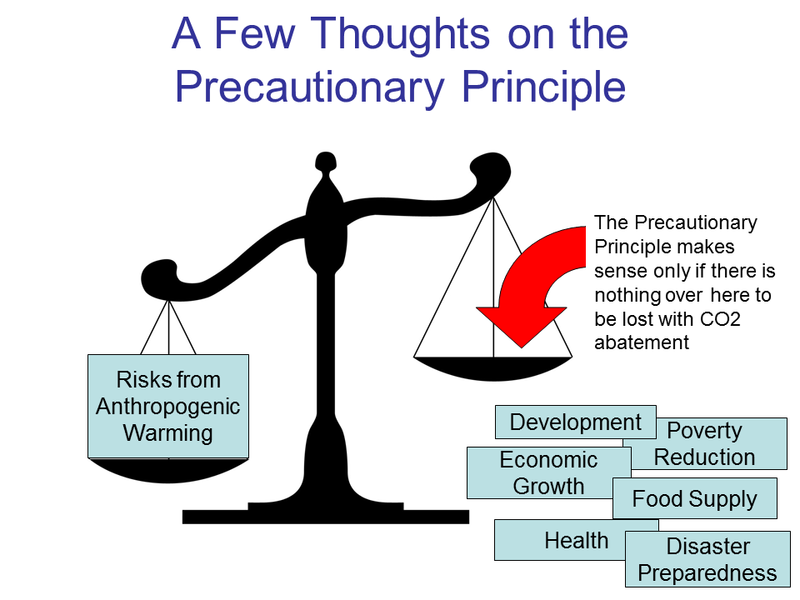 By the precautionary principle as stated, we would never have approved any vaccine, because the precautionary principle does not put any weight on avoided costs of the action. So take fossil fuel burning. Proponents of taking drastic action to curb fossil fuel use in the name of global warming prevention will argue that until there is an absolute consensus that burning fossil fuels is not harmful to the climate, such burning should be banned. But it ignores the substantial, staggering, unbelievably-positive effects we have gained from fossil fuels and the technology and economy they support. 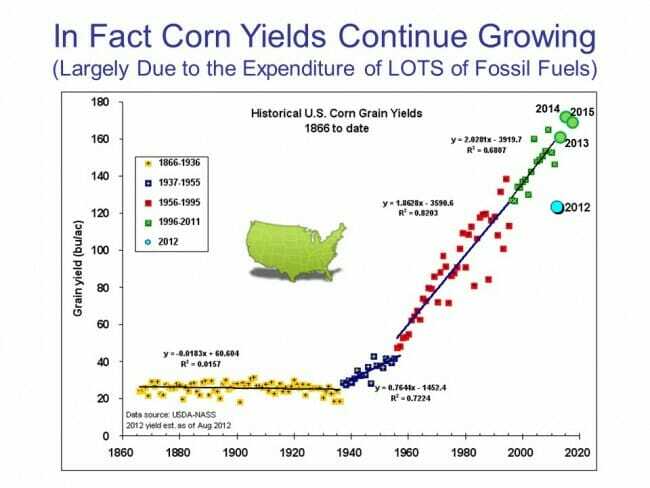 Just remember back to that corn yield chart. 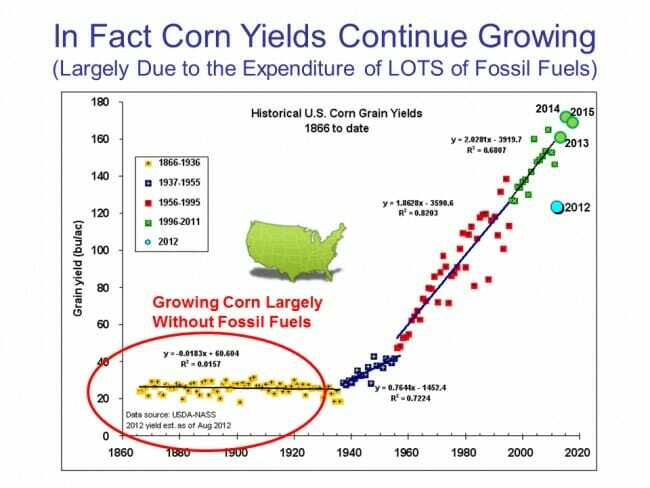 Bill McKibbon wants us to stop using fossil fuels because they may cause warmer temperatures that might reduce corn yields. 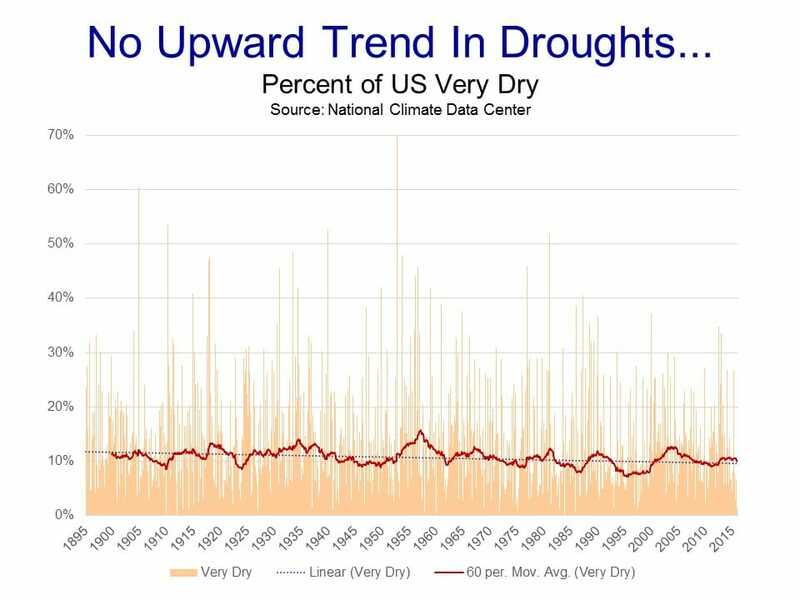 But there is a near absolute certainty that dismantling the fossil fuel economy will take us back to the horrendous yields in the yellow years on this chart. Proponents of climate action point to the possibility of warming-based problems, but miss the near certainty of problems from elimination of fossil fuels. 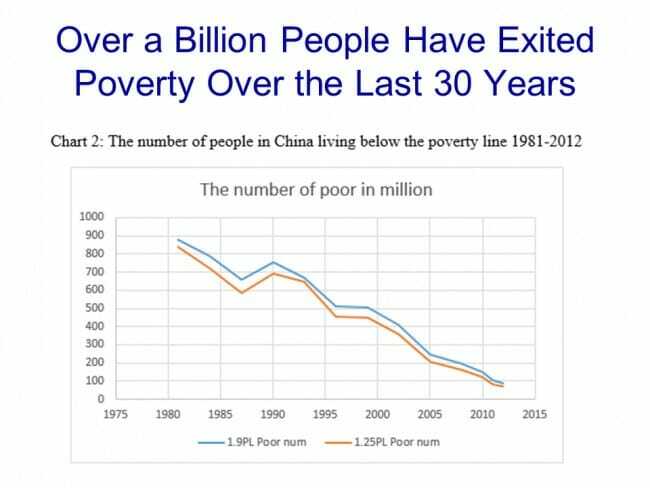 Over the last 30 years, something unprecedented in the history of human civilization has occurred -- an astounding number of people have exited absolute poverty. Folks like McKibbon act like there is no downside to drastically cutting back on fossil fuel use and switching to substantially more expensive and less convenient fuels, as if protecting Exxon's profits are the only reason anyone would possibly oppose such a measure. 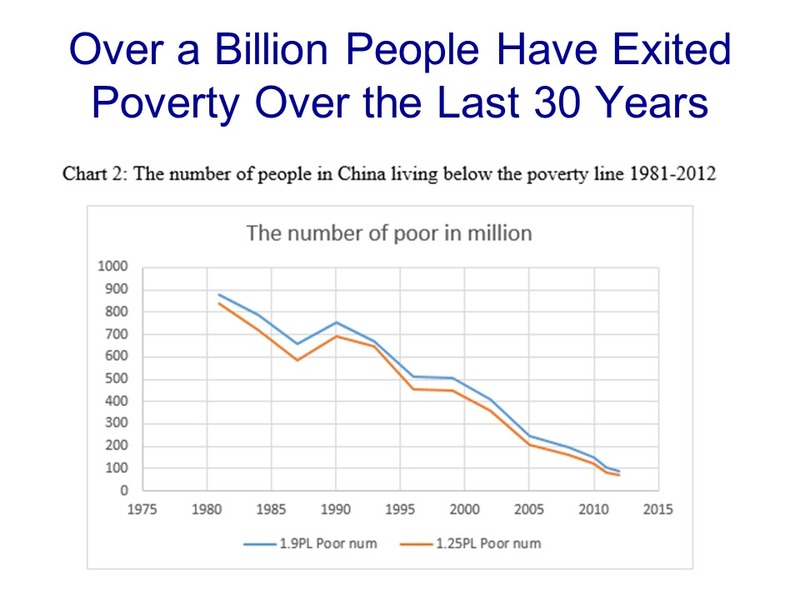 But the billion or so people who have exited poverty of late have done so by burning every bit of fossil fuels than can obtain, and never would have been able to do so in such numbers had such an inexpensive fuel option not been available. We in the West could likely afford having to pay $50 a month more for fuel, but what of the poor of the world? Perhaps this will give one an idea of how central inexpensive fossil fuels are to well-being. This is a chart from World Bank data plotting each country based on their per capital CO2 production and their lifespan. 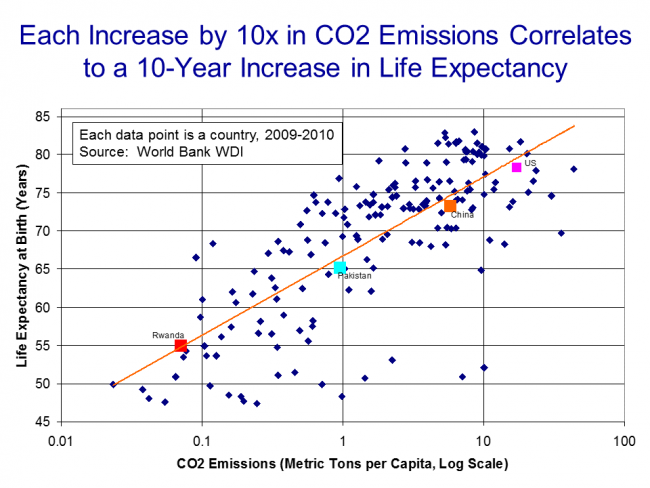 As you can see, there is a real, meaningful relationship between CO2 production and life expectancy. 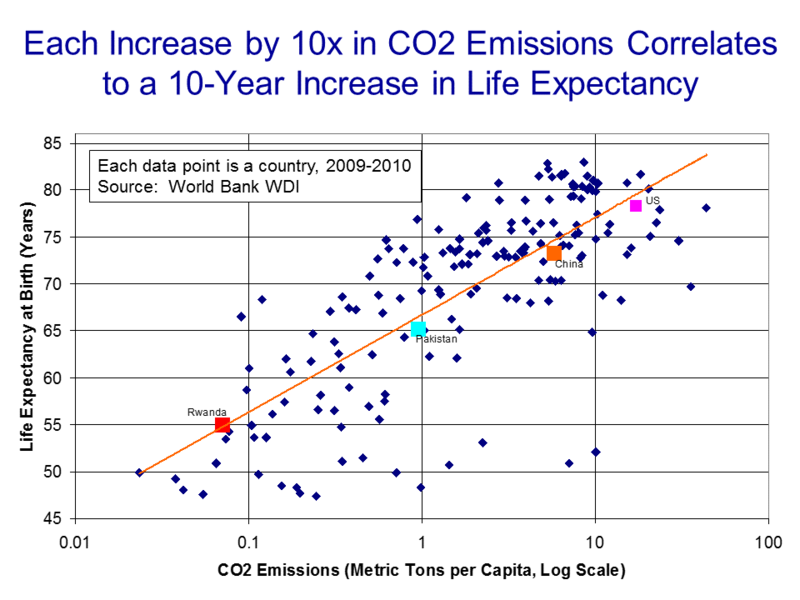 In fact, each 10x increase in CO2 production is correlated with 10 years of additional life expectancy. Of course, this relationship is not direct -- CO2 itself does not have health benefits (if one is not a plant). But burning more CO2 is a byproduct of a growing technological economy, which leads to greater wealth and life expectancy. The problem, then, is not that we shouldn't consider the future potential costs and risks of climate change, but that we shouldn't consider them in a vaccuum without also considering the costs of placing severe artificial limits on inexpensive fossil fuels. People often say to me that climate action is an insurance policy -- and they ask me, "you buy insurance, don't you?" My answer invariably is, "yes, I buy insurance, but not when the cost of the policy is greater than the risk being insured against." As it turns out, there is an approach we can take in this country to creating a low-cost insurance policy against the risks that temperature sensitivity to CO2 is higher than I have estimated in this series. I will outline that plan in my final chapter. Denying the Climate Catastrophe: 7. Are We Already Seeing Climate Change? Note: This is by far the longest chapter, and could have been 10x longer without a lot of aggressive editing. I have chosen not to break it into two pieces. Sorry for the length. TL;DR: The vast majority of claims of current climate impacts from CO2 are grossly exaggerated or even wholly unsupported by the actual data. The average quality of published studies in this area is very low compared to other parts of climate science. 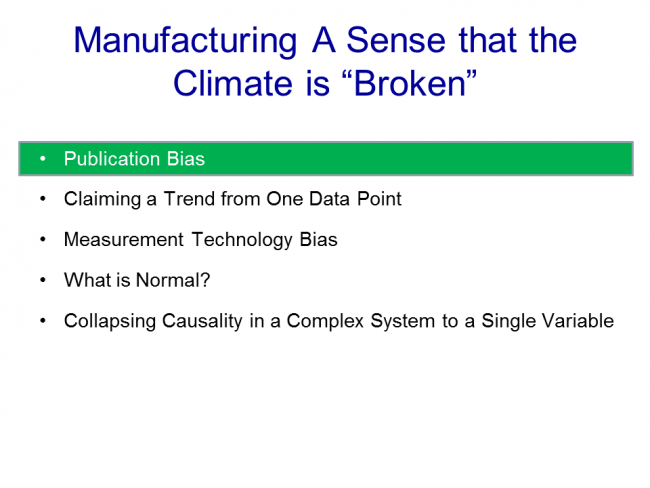 Having discussed the theory and reality of man-made warming, we move in this chapter to what is often called "climate change" -- is manmade warming already causing adverse changes in the climate? This is a peculiarly frustrating topic for a number of reasons. First, everyone who discusses climate change automatically assumes the changes will be for the worse. But are they? The Medieval Warm Period, likely warmer than today, was a period of agricultural plenty and demographic expansion (at least in Europe) -- it was only the end of the warm period that brought catastrophe, in the form of famine and disease. As the world warms, are longer growing seasons in the colder parts of the northern hemisphere really so bad, and why is it no one ever mentions such positive offsets? Finally, and perhaps the most frustrating issue, is that handling claims of various purported man-made changes to the climate has become an endless game of "wack-a-mole". 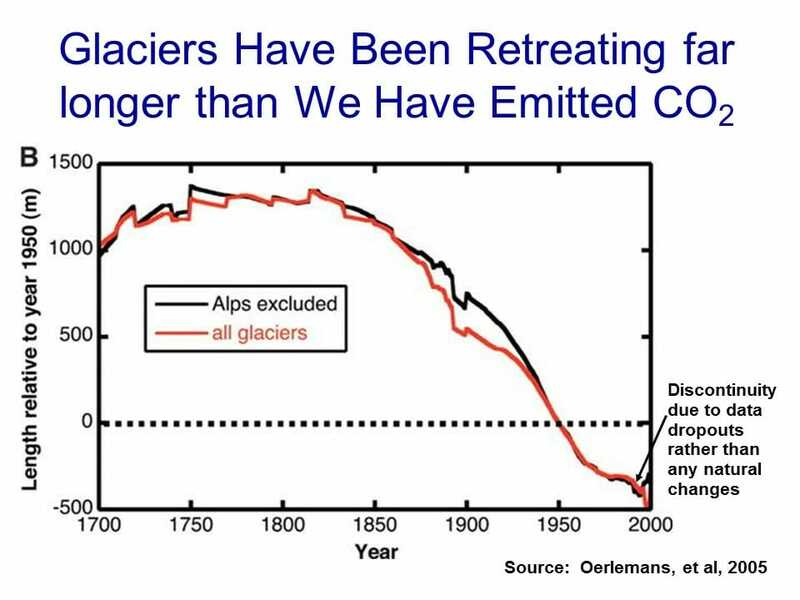 It is almost impossible to keep up with the myriad claims of things that are changing (always for the worse) due to CO2. One reason that has been suggested for this endless proliferation of dire predictions is that if one wants to study the mating habits of the ocelot, one may have trouble getting funding, but funding is available in large quantities if you re-brand your study as the effect of climate change on the mating habits of the ocelot. It is the unusual weather event or natural phenomenon (Zika virus!) that is not blamed by someone somewhere on man-made climate change. As a result, this section could be near-infinitely long. 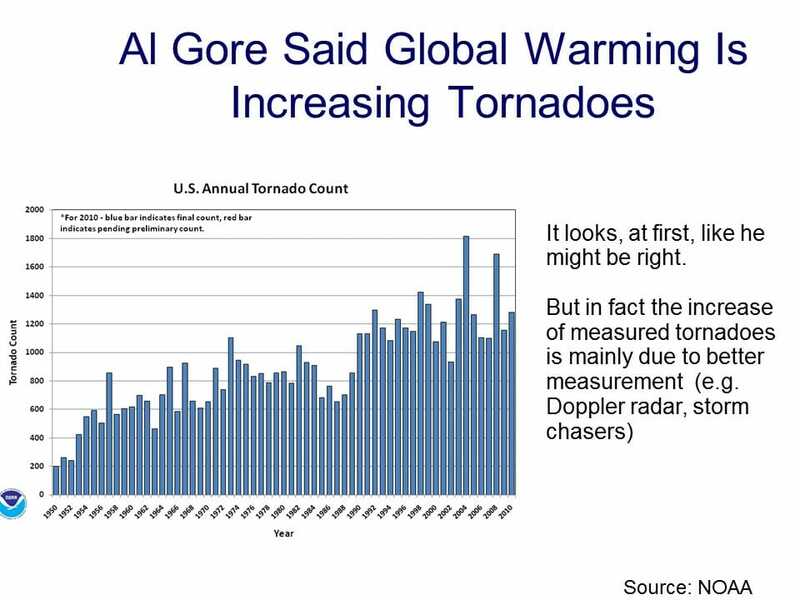 To avoid that, and to avoid a quickly tedious series of charts labelled "hurricanes not up", "tornadoes not up", etc., I want to focus more on the systematic errors that lead to the false impression that we are seeing man-made climate changes all around us. We will start with publication bias, which I would define as having a trend in the reporting of a type of an event mistaken for a trend in the underlying events itself. Let's start with a classic example from outside climate, the "summer of the shark". The media hysteria began in early July, 2001, when a young boy was bitten by a shark on a beach in Florida. Subsequent attacks received breathless media coverage, up to and including near-nightly footage from TV helicopters of swimming sharks. 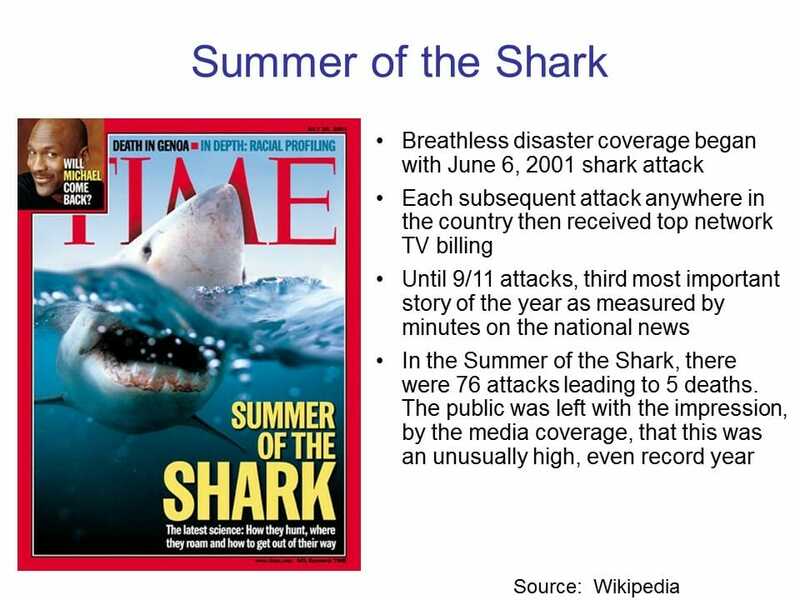 Until the 9/11 attacks, sharks were the third biggest story of the year as measured by the time dedicated to it on the three major broadcast networks’ news shows. Through this coverage, Americans were left with a strong impression that something unusual was happening — that an unprecedented number of shark attacks were occurring in that year, and the media dedicated endless coverage to speculation by various “experts” as to the cause of this sharp increase in attacks. Except there was one problem — there was no sharp increase in attacks. In the year 2001, five people died in 76 shark attacks. However, just a year earlier, 12 people had died in 85 attacks. The data showed that 2001 actually was a down year for shark attacks. The increased media coverage of shark attacks was mistaken for an increase in shark attacks themselves. 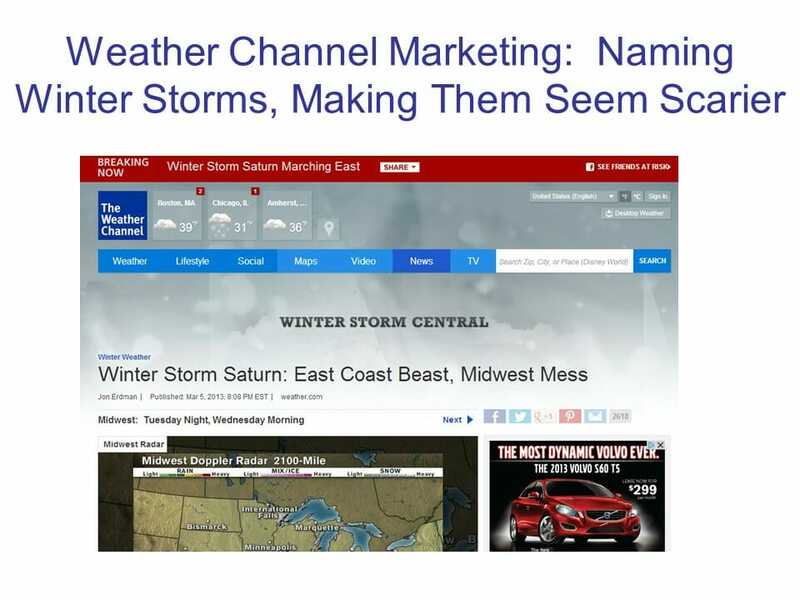 When I grew up, winter storms were never named. It was just more snow in Buffalo, or wherever. Now, though, we get "Winter Storm Saturn: East Coast Beast." Is the weather really getting scarier, or just the reporting? The second systematic error is not limited to climate, and is so common I actually have a category on my blog called "trend that is not a trend". There is a certain chutzpah involved in claiming a trend when it actually does not exist in the data, but such claims occur all the time. 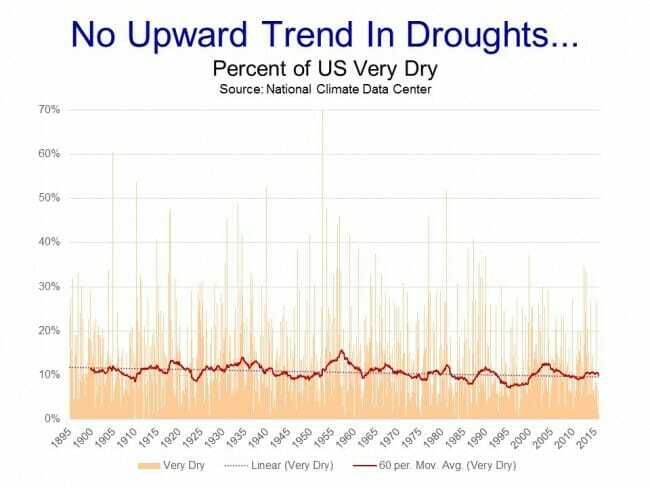 In climate, a frequent variation on this failure is the claiming of a trend from a single data point -- specifically, a tail-of-the-distribution weather event will be put forward as "proof" that climate is changing, ie that there is a trend to the worse somehow in the Earth's climate. The classic example was probably just after Hurricane Katrina. In a speech in September of 2005 in San Francisco, Al Gore told his Sierra Club audience that not only was Katrina undoubtedly caused by man-made global warming, but that it was the harbinger of a catastrophic onslaught of future such hurricanes. 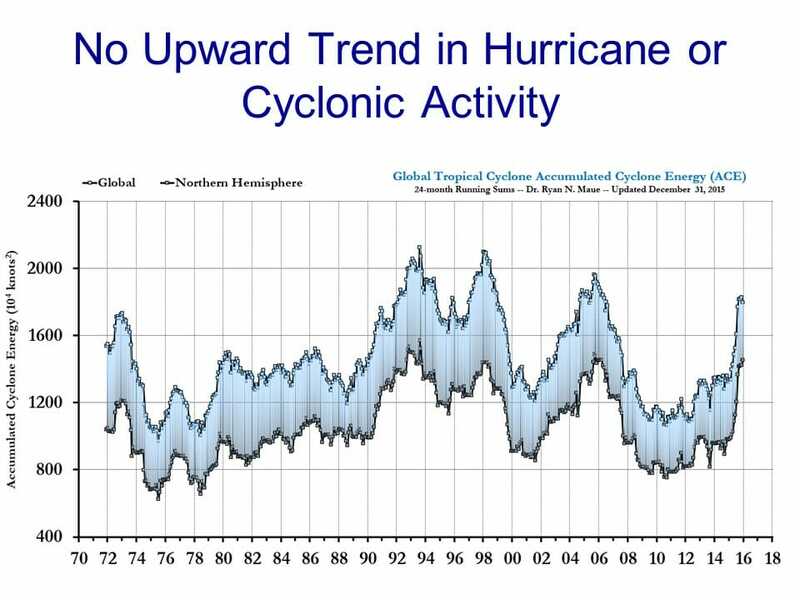 In fact, though, there is no upward trend in Hurricane activity. 2005 was a high but not unprecedented year for hurricanes. An Katrina was soon followed by a long and historic lull in North American hurricane activity. Of course, it is likely that increasing wealth and better technology are responsible for much of this mitigation, rather than changes in underlying weather patterns, but this is still relevant to the debate -- many proposed CO2 abatement plans would have the effect of slowing growth in the developing world, leaving them more vulnerable to weather events. 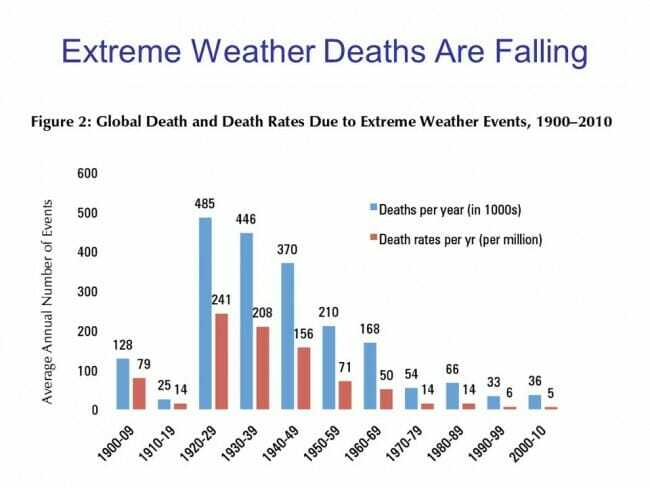 I have argued for years that the best way to fight weather deaths is to make the world rich, not to worry about 1 hurricane more or less. 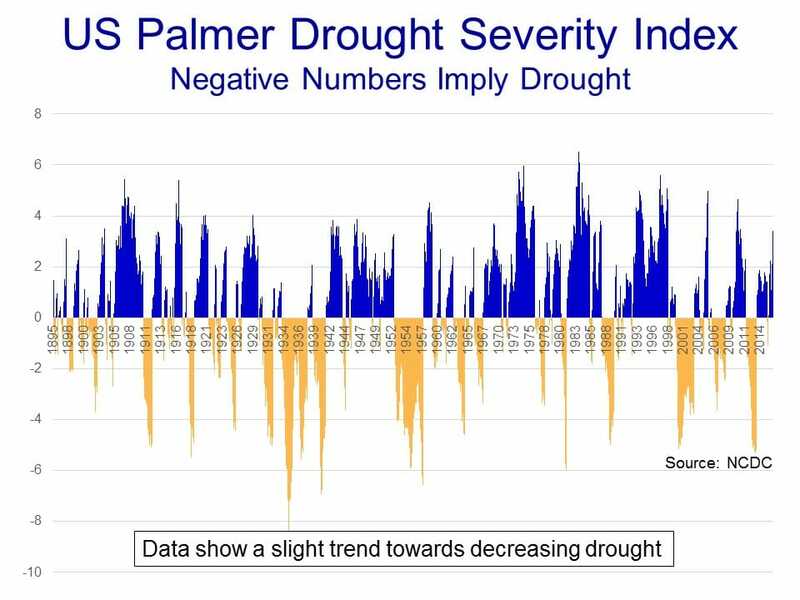 It turns out that based on US government data, the 2012 drought was certainly severe but no worse than several other droughts of the last 50 years (negative numbers represent drought). US corn yields indeed were down in 2012, but still higher than at any time they had been since 1995. 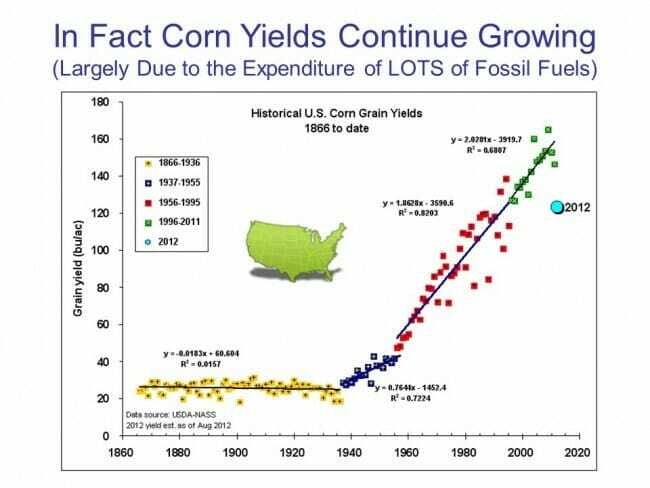 It is worth noting the strong upward trend in corn yields from 1940 to today, at the same time the world has supposedly experienced unprecedented man-made warming. I might also point out the years in yellow, which were grown prior to the strong automation of farming via the fossil fuel economy. 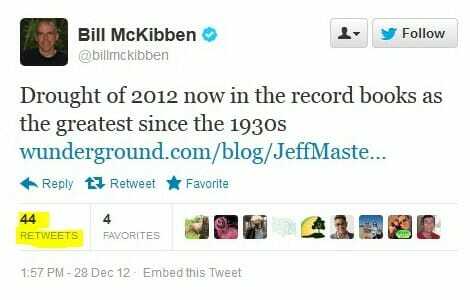 Bill McKibben hates fossil fuels, and believes they should be entirely eliminated. If so, he also must "own" the corn yields in yellow. CO2-driven warming has not inhibited corn yields, but having McKibben return us to a pre-modern economy certainly would. Anyway, as you might expect, corn yields after 2012 return right back to trend and continue to hit new records. 2012 did not represent a new trend, it was simply one bad year. I think most folks would absolutely swear, from media coverage, that the US is seeing more new high temperatures set and an upward trend in heat waves. But it turns out neither is the case. Obviously, one has to be careful with this analysis. Many temperature stations in the US Historical Climate Network have only been there for 20 or 30 years, so their all time high at that station for any given day is, by definition, going to be in the last 20 or 30 years. 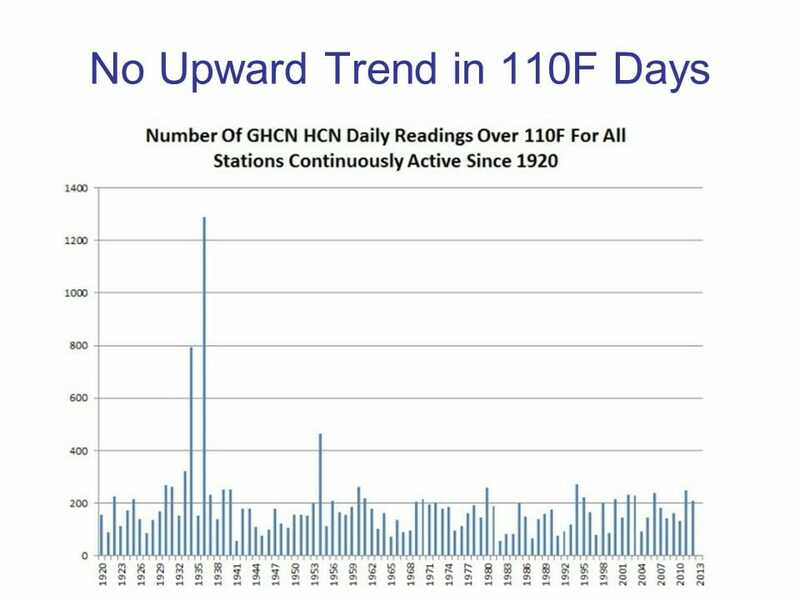 But if one looks at temperature stations with many years of data, as done above, we can see there has been no particular uptick in high temperature records and in fact a disproportionate number of our all-time local records were set in the 1930's. We can measure things much more carefully and accurately than we could in the past. This is a good thing, except when we are trying to compare the past to the present. In a previous chapter, we showed a count of sunspots, and databases of sunspot counts go all the way back into the early 18th century. Were telescopes in 1716 able to see all the sunspots we can see in 2016? Or might an upward trend in sunspot counts be biased by our better ability today to detect small ones? This certainly looks scary. Tornadoes have increased by a factor of 5 or 6! 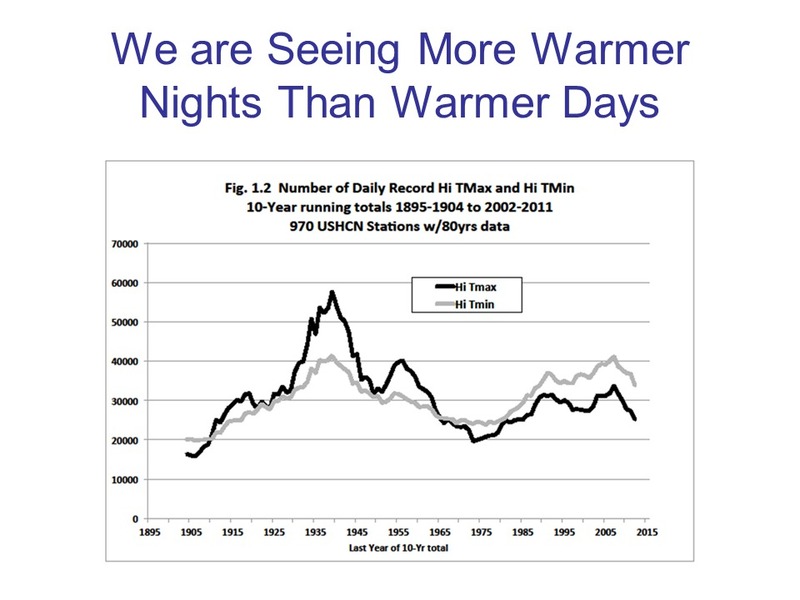 But if you look at the NOAA web site, right under this chart, there is a big warning that ways to beware of this data. With doppler radar and storm chasers and all kinds of other new measurement technologies, we can detect smaller tornadoes that were not counted in the 1950's. 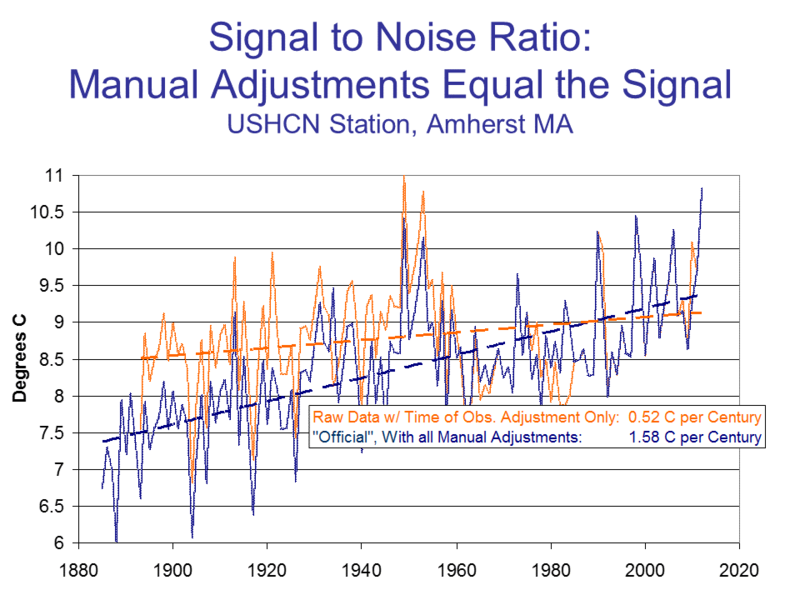 The NOAA is careful to explain that this chart is biased by changes in measurement technology. 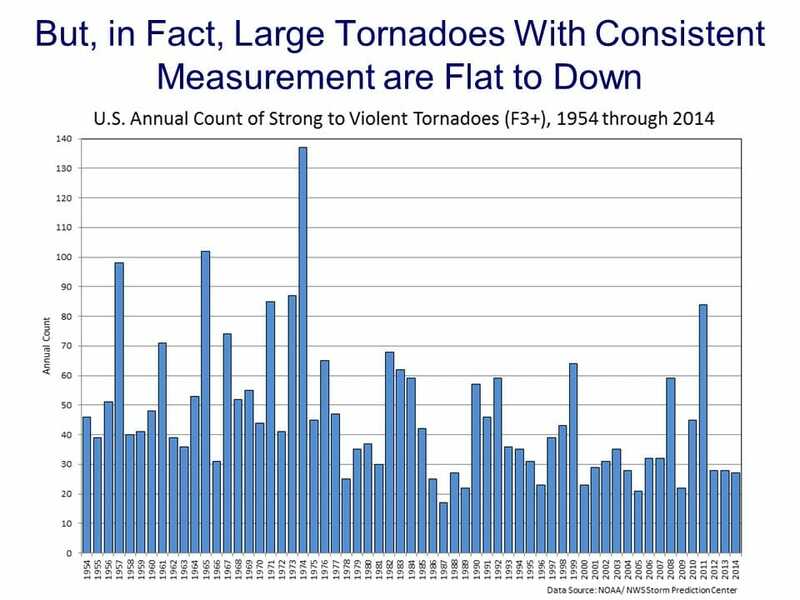 If one looks only at larger tornadoes we were unlikely to miss in the 1950's, there is no upward trend, and in fact there may be a slightly declining trend. 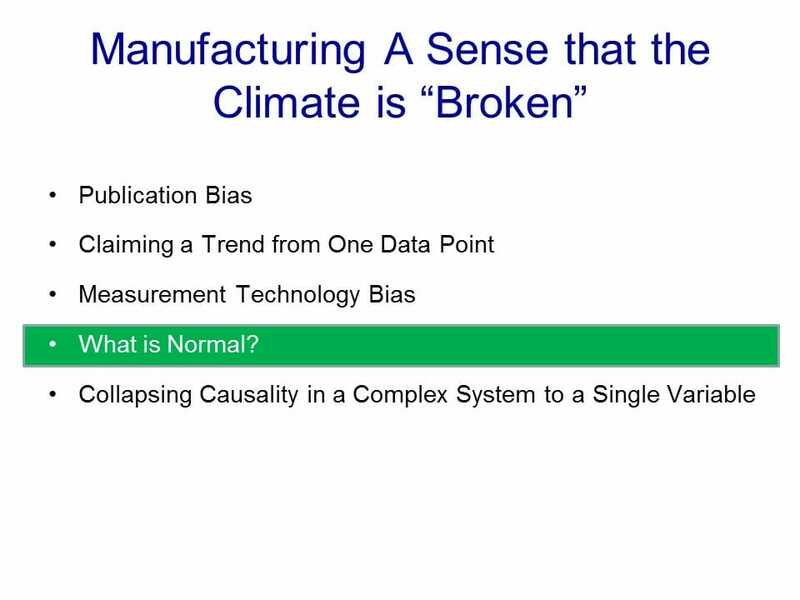 Behind nearly every media story about "abnormal" weather or that the climate is somehow "broken" is an explicit assumption that we know what "normal" is. Do we? 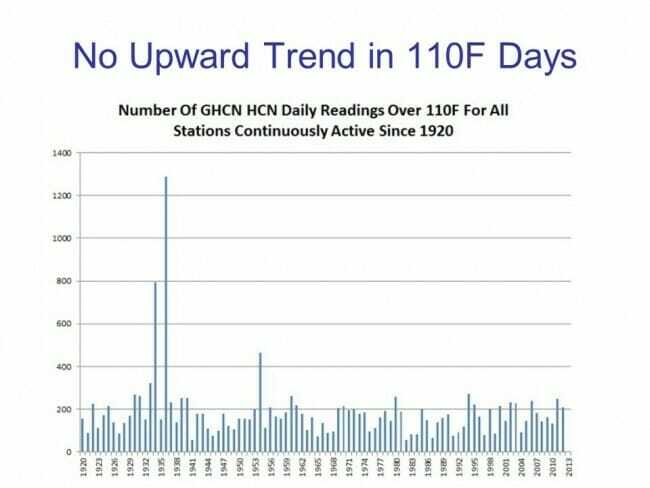 We have been keeping systematic weather records for perhaps 150 years, and have really been observing the climate in detail for perhaps 30 years. Many of our best tools are space-based and obviously only have 20-30 years of data at most. 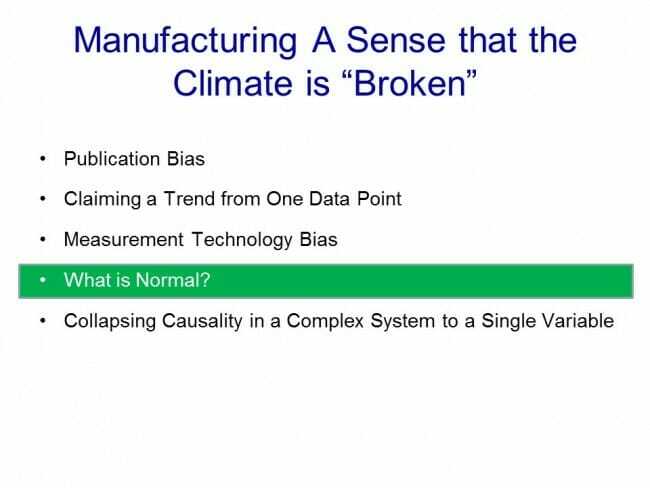 Almost no one thinks we have been able to observe climate in depth through many of its natural cycles, so how do we know exactly what is normal? Which year do we point to and say, "that was the normal year, that was the benchmark"? In fact, glaciers have been retreating around the world since the end of the Little Ice Age (I like to date it to 1812, with visions of Napoleon's army freezing in Russia, but that is of course arbitrary). As you can see, from a distance perspective, most of the retreat actually occurred before 1900. 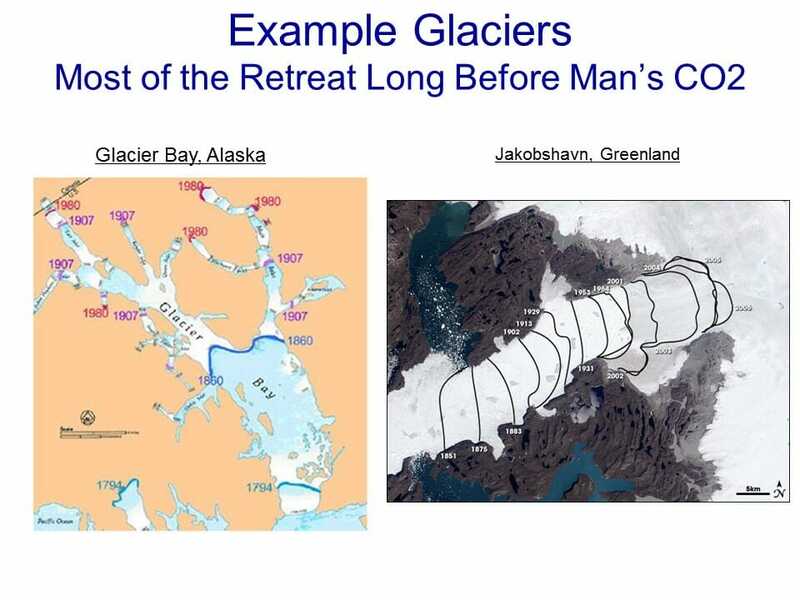 If one wants to blame the modern retreat of these glaciers on man, one is left with the uncomfortable argument that natural forces drove the retreat until about 1950, at which point the natural forces stopped just in time for man-made effects to take over. Melting ice is often linked to sea level rise, though interestingly net ice melting contributes little to IPCC forecasts of sea level rises due to expected offsets with ice building in Antarctica -- most forecast sea level rise comes from the thermal expansion of water in the oceans. And of course, the melting arctic sea ice that makes the news so often contributes nothing to sea level rise (which is why your water does not overflow your glass when the ice melts). 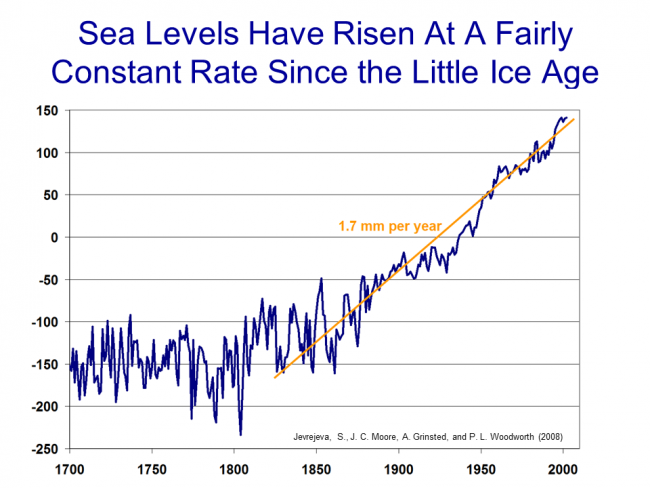 There is some debate about manual corrections added to more recent data (that should sound familiar to those reading this whole series) but recent sea level rise seems to be no more than 3 mm per year. At most, recent warming has added perhaps 1 mm a year to the natural trend, or about 4 inches a century. Our last failure mode is again one I see much more widely than just in climate. 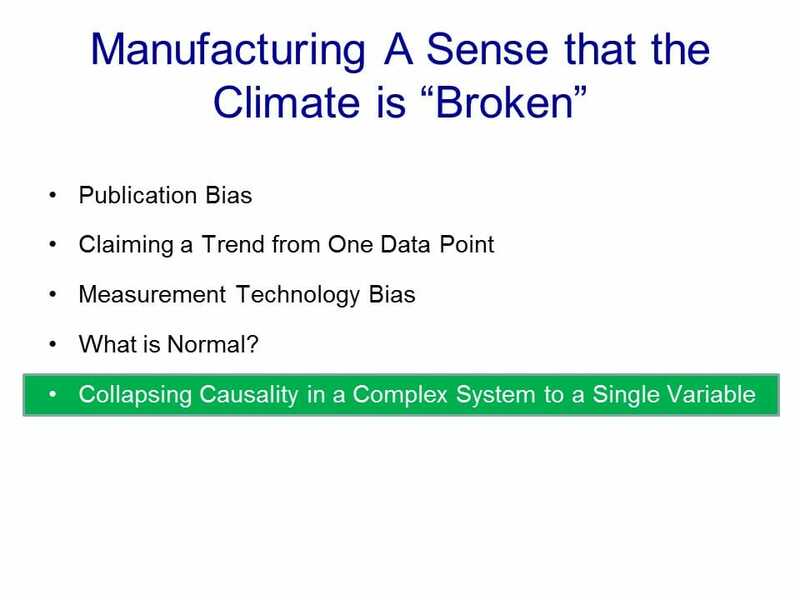 Whether the realm is economics or climate or human behavior, the media loves to claim that incredibly complex, multi-variable systems are in fact driven by a single variable, and -- who'd have thunk it -- that single variable happens to fit with their personal pet theory. With all the vast complexity of the climate, are we really to believe that every unusual weather event is caused by a 0.013 percentage point change (270 ppm to 400 ppm) in the concentration of one atmospheric gas? Let me illustrate this in another way. 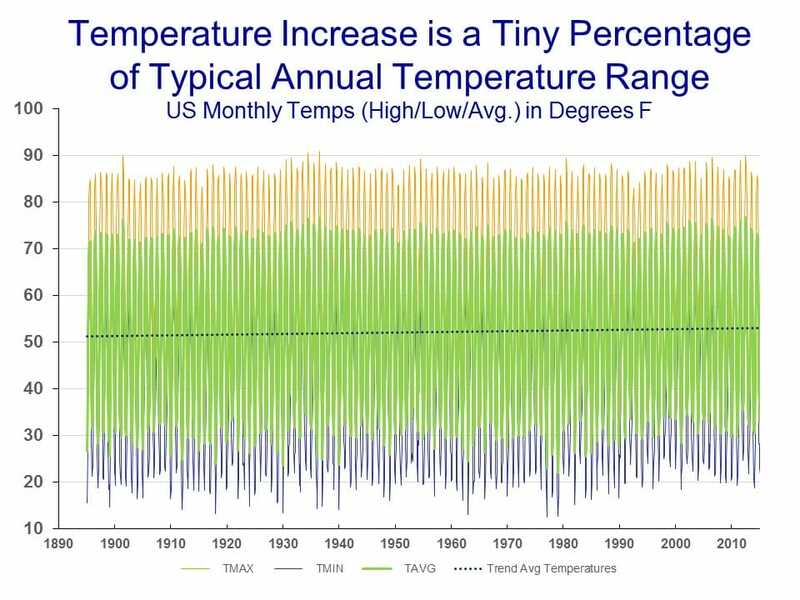 The NOAA not only publishes a temperature anomaly (which we have mostly been using in all of our charts) but they take a shot at coming up with an average temperature for the US. The following chart uses their data for the monthly average of Tmax (the daily high at all locations), Tmin (the daily low for all locations) and Tavg (generally the average of Tmin and Tmax). Note that even the average temperatures vary across a range of 40F through the seasons and years. If one includes the daily high and low, the temperatures vary over a range of nearly 70F. And note that this is the average for all the US over a month. If we were to look at the range of daily temperatures across the breath of locations, we would see numbers that varied from well into the negative numbers to over 110. The point of all this is that temperatures vary naturally a lot. Now look at the dotted black line. That is the long-term trend in the average, trending slightly up (since we know that average temperatures have risen over the last century). 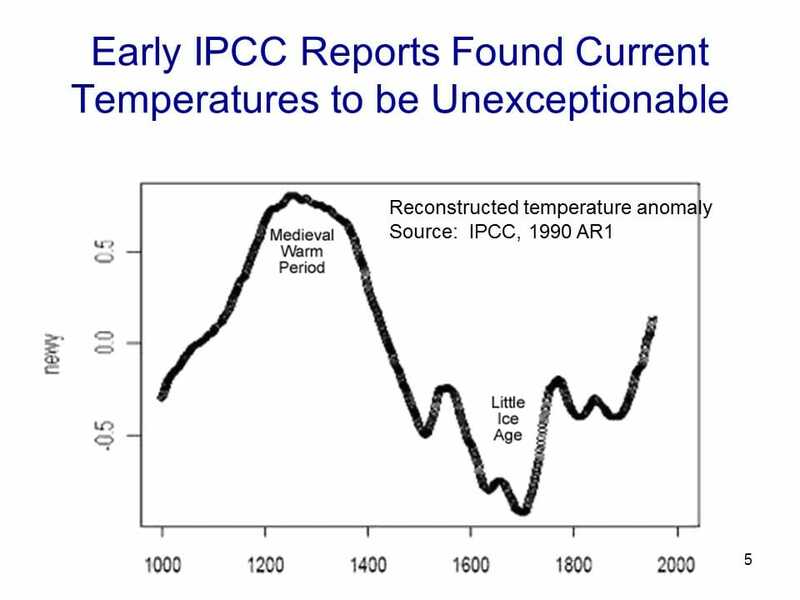 The slope of that line, around 1F per century for the US, is virtually indistinguishable. It is tiny, tiny, tiny compared to the natural variation of the averages. The point of this is not that small increases in the average don't matter, but that it is irrational to blame every tail-of-the-distribution temperature event on man-made warming, since no matter how large we decide that number has been, its trivial compared to the natural variation we see in temperatures. OK, I know that was long, but this section was actually pretty aggressively edited even to get it this short. For God sakes, we didn't even mention polar bears (the animals that have already survived through several ice-free inter-glacial periods but will supposedly die if we melt too much ice today). But its time to start driving towards a conclusion, which we will do in our next chapter. Chapter 8, summarizing the lukewarmer middle ground, is here. In some sense, this is perhaps the most important chapter, the climax of all the discussion to this point. It is where we return to climate forecasts and attempt to conclude whether forecasts of catastrophic levels of man-made warming are reasonable. So let's take a step back and see where we are. Here is the framework we have been working with -- we have walked through in earlier chapters both the "theory" and "observation" sections, ending most recently in chapter 5 with a discussion of how much past warming can be attributed to man. It is important to remember why we embarked on the observation section. 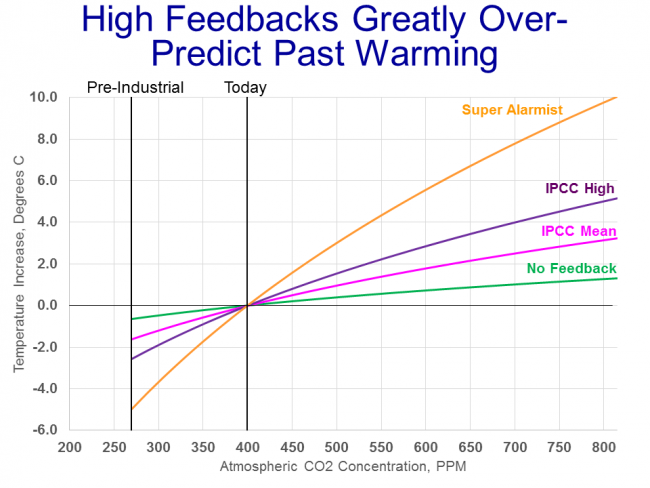 We ended the theory section with a range of future temperature forecasts, from the modest to the catastrophic, based on differing sensitivities of temperature to CO2 which were in turn largely based on varying assumptions about positive feedback effects in the climate. We concluded at the time that there was not much more we could go with pure theory in differentiating between these forecasts, that we had to consult actual observations to validate or invalidate these forecasts. But in the grand scheme of things, even 30 years is a pretty short time frame to discuss climate changes. Remember that in my own attribution attempt in Chapter 5, I posited an important 66 year decadal cycle, and past temperature reconstructions imply other cycles that are centuries and millennia long. 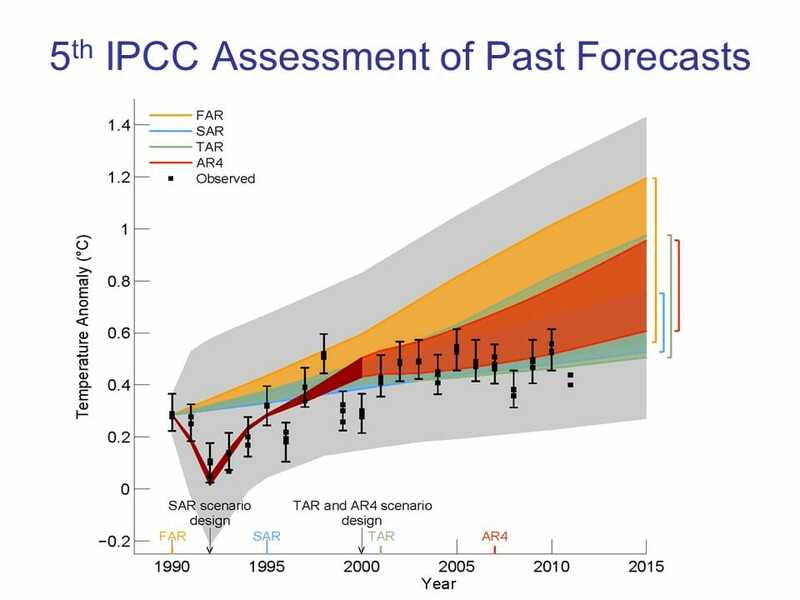 Here is the key insight that is going to help us evaluate the forecasts: each forecast represents an actual, physical relationship between changes in CO2 concentrations and changes in temperature. If such a relationship is to hold in the future, it also has to be valid in the past. So we can take each of these different forecasts for the relation between temperature and CO2 and run them backwards to pre-industrial times in the 19th century, when atmospheric CO2 concentrations were thought to be around 270 ppm. Of course we are leaving out the time dimension -- many of the hypothesized feedbacks take time to operate, so the initial transient response of the world's temperatures is not the same as the longer-term equilibrium response. But transient response likely is at least 2/3 of the full equilibrium value, meaning that my hypothesized value for man-made past warming of 0.33C would still be less than the no feedback case on an equilibrium basis. 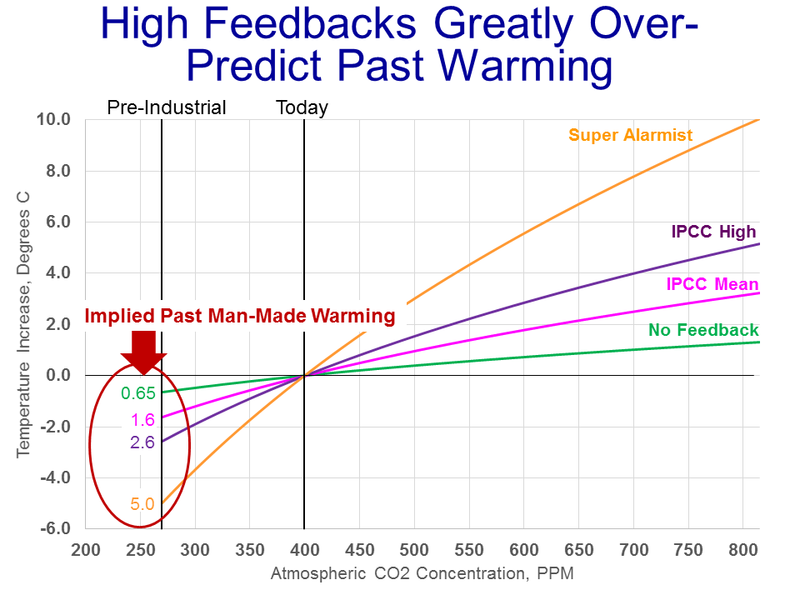 It is from this analysis that I first convinced myself that man-made warming was unlikely to be catastrophic. I want to add two notes here. 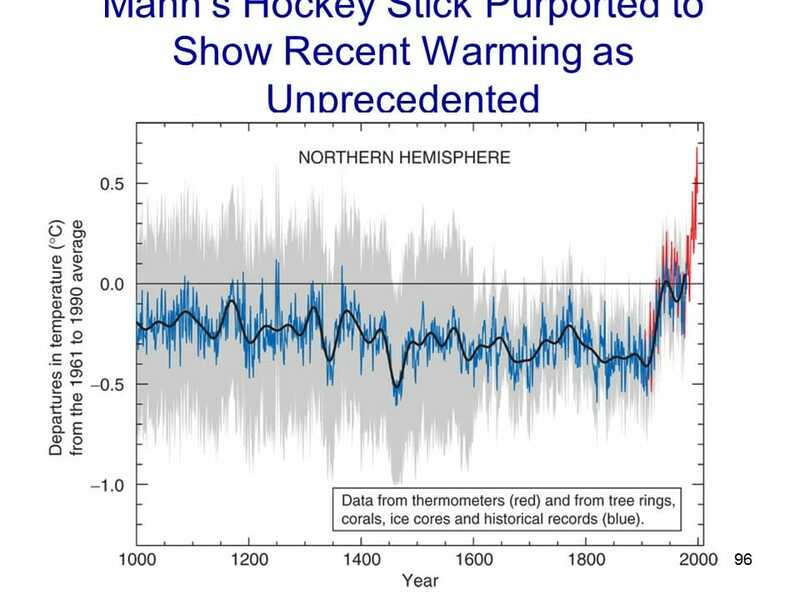 First, we mentioned back in the attribution section that some scientists argue that man has caused not all of but more than the total observed historical warming. This chapter's analysis explains why. The fact that climate models tend to overpredict history is not a secret among climate modelers (though it is something they seldom discuss publicly). 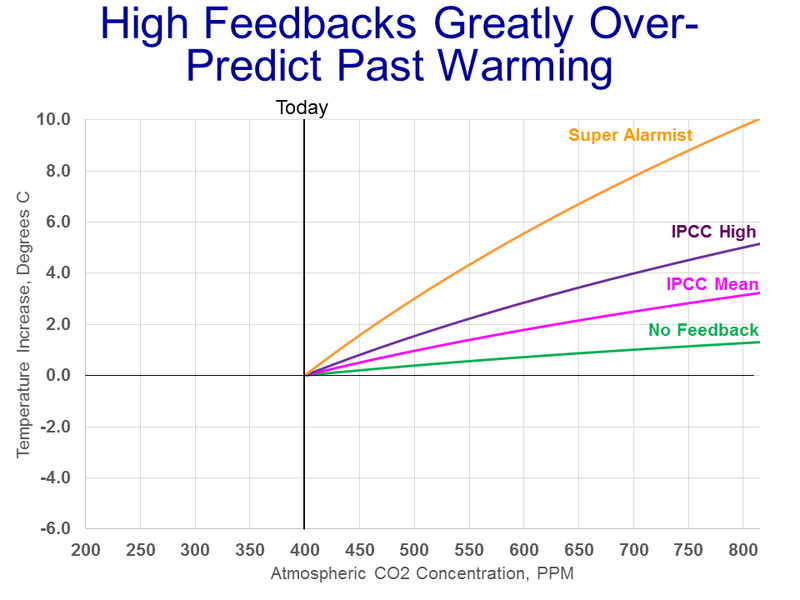 To justify their high feedback and sensitivity assumptions in their forecasts, they need more warming in the past. 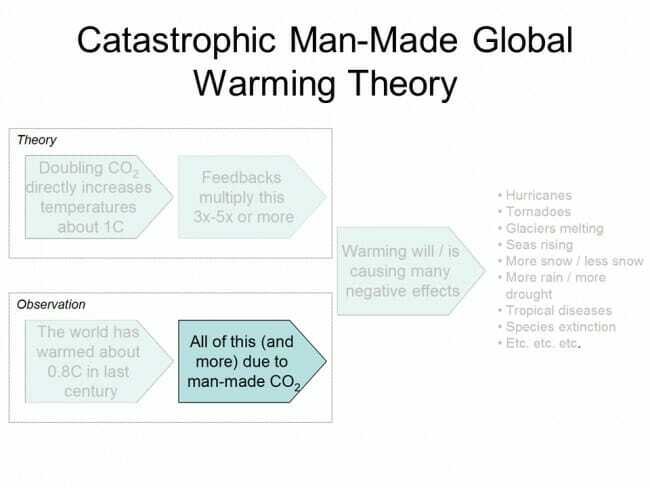 One way to do this is to argue that the world would have cooled without man-made CO2, so that man-made CO2 contributed 0.8C of warming in addition to whatever the cooling would have been. It allows attribution of more than 100% of past warming to man. There are various ways this is attempted, but the most popular centers around man-made sulfate aerosols. 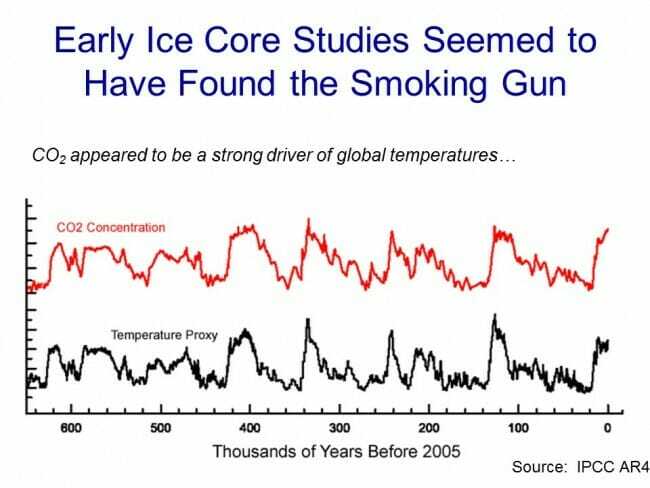 These aerosols are byproducts of burning sulfur-heavy fossil fuels, particularly coal, and they tend to have a cooling effect on the atmosphere (this is one reason why, in the 1970's, the consensus climate prediction was that man was causing the world to cool, not warm). Some scientists argue that these aerosols have tended to cool the Earth over the past decades, but as we clean up our fuels their effect will go away and we will get catch-up warming. There are a couple of problems with this line of thought. 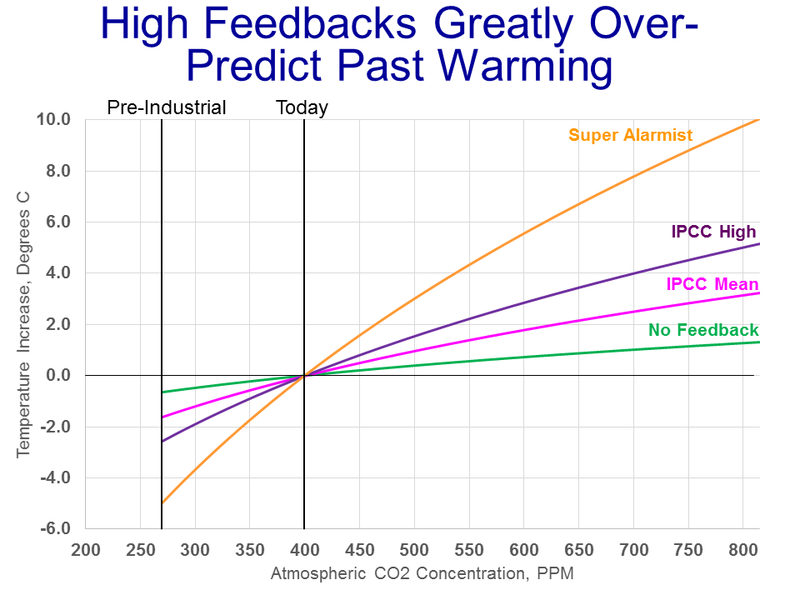 The first is that we understand even less about the magnitude of aerosol cooling than we do of CO2 warming. Any value we choose is almost a blind guess (though as we shall see in a moment, this can be a boon to modelers on a mission). The second issue is that these aerosols tend to be very short-lived and local. They don't remain in the atmosphere long enough to thoroughly mix and have a global effect. Given their localization and observed concentrations, it is almost impossible to imagine them having more than a tenth or two effect on world temperatures. And I will add that if we need to take into account cooling from sulfate aerosols, we also need to take into account the warming and ice melting effect of black carbon soot from dirty Asian coal combustion. But we will return to that later in our section on Arctic ice. My second, related note is that scientists will frequently claim that their computer models models do claim correctly match historic temperatures when run backwards. As a long-time modeler of complex systems, my advice is this: don't believe it until you have inspected the model in detail. At least 9 times out of 10, one will find that this sort of tight fit with history is the result of manual tweaking, usually from the affect of a few "plug" variables. 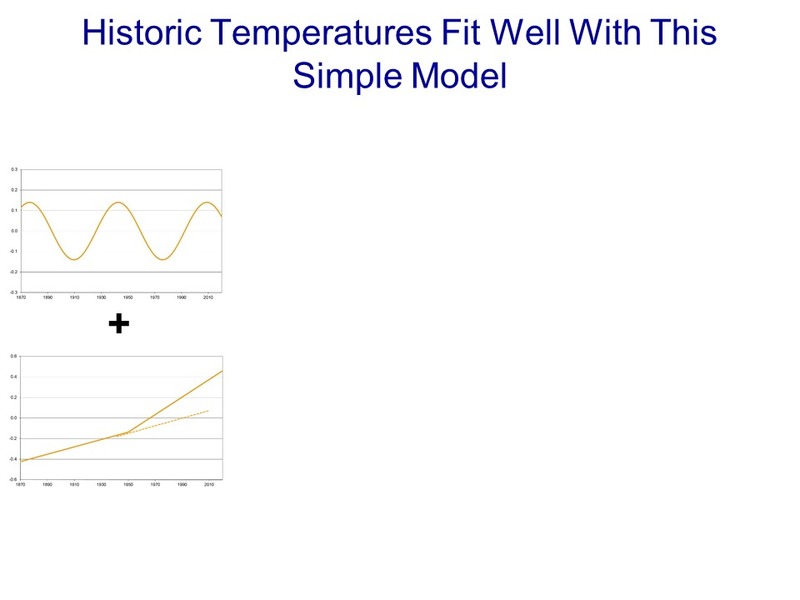 Here is one example -- there was a study a while back that tried to understand how a number of different climate models could all arrive at very different temperature sensitivities to CO2, but all still claim to model the same history accurately. 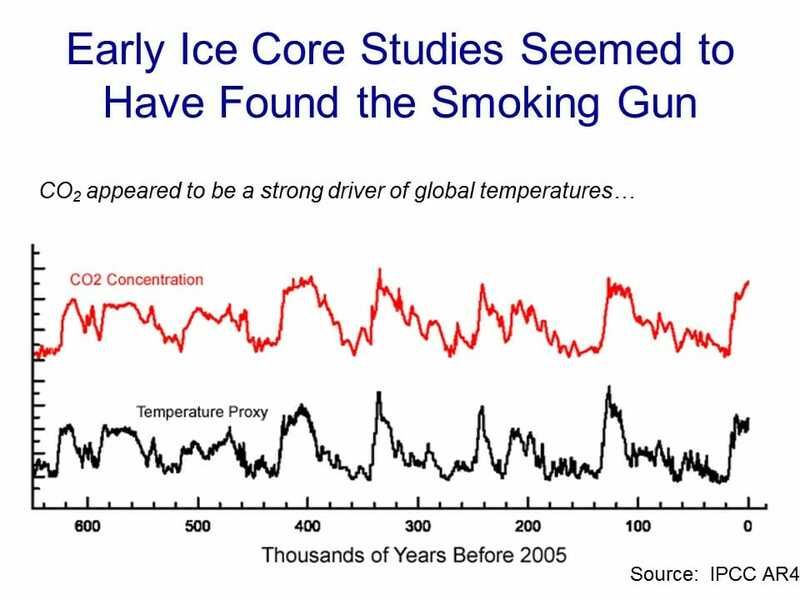 What was found was that there was a second variable -- past cooling from man-made aerosols, discussed above -- that also varied greatly between models. And it turned out that the value chosen in the models for this second variable was exactly the value necessary to make that model's output match history -- that is why I said that our very lack of knowledge of the actual cooling from such aerosols could be a boon to modelers on a mission. In essence, there is a strong suspicion that this variable's value was not based on any observational evidence, but was simply chosen as a plug figure to make the model match history. 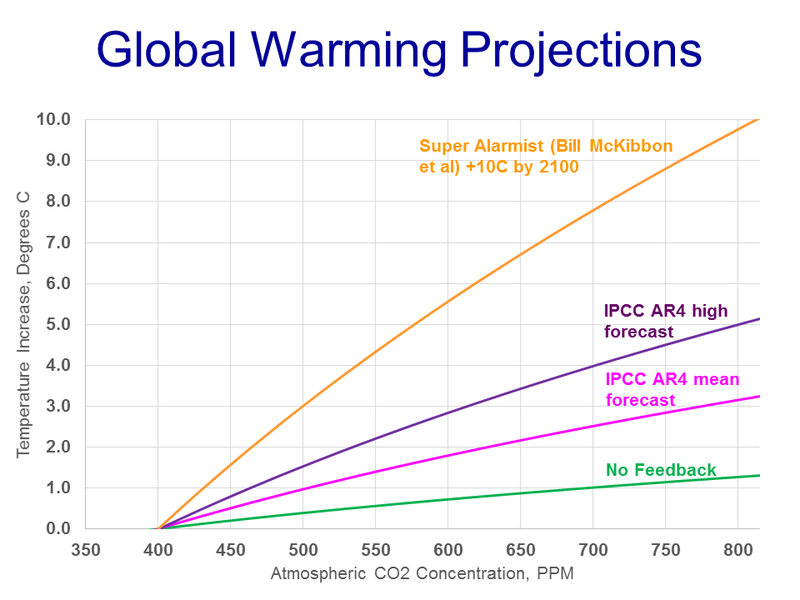 Having gone about as far as we can with the forecasts without diving into a whole new order of detail, let's move on to the final alarmist contention, that man-made CO2 is already changing the climate for the worse. We will discuss this in Chapter 7. 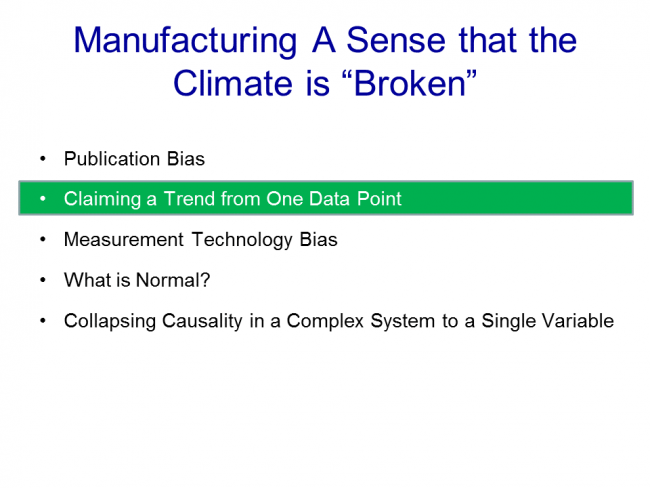 Chapter 7 on whether we are already seeing man-made climate change is here. 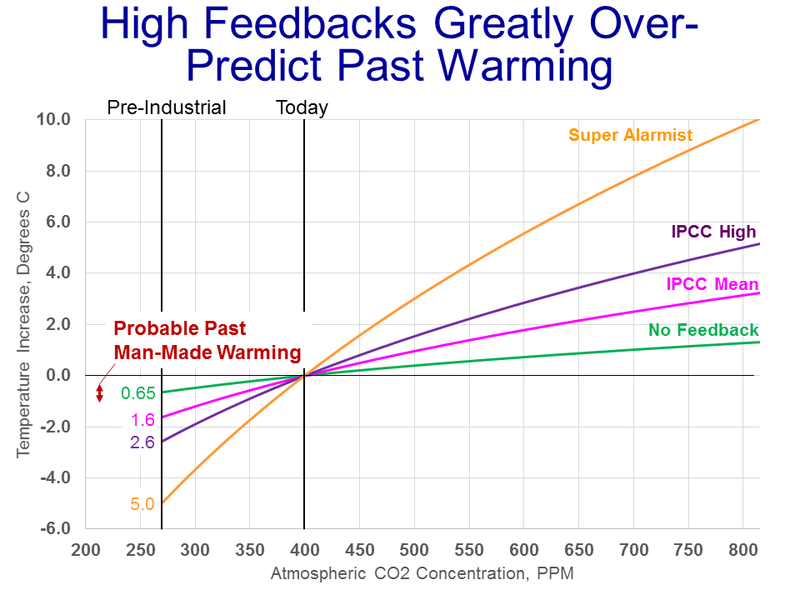 In part A, we discussed the main line of argument for attributing past warming to man-made CO2. In essence, scientists have built computer models to simulate the climate (and global temperatures). 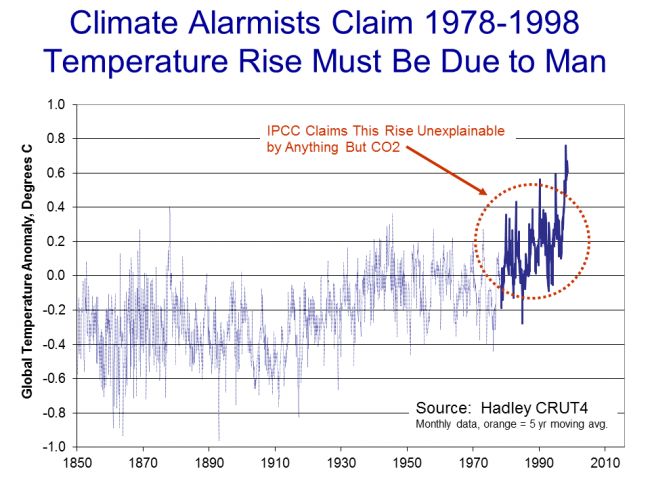 When these models were unable to simulate the amount of warming that occurred in the two decades between 1978 and 1998 using only what they thought were the major natural climate drivers, scientists concluded that this warming could not have been natural and could only have happened if the climate has a high sensitivity to man-made CO2. This argument only works, of course, if the climate models are actually a correct representation of the climate. 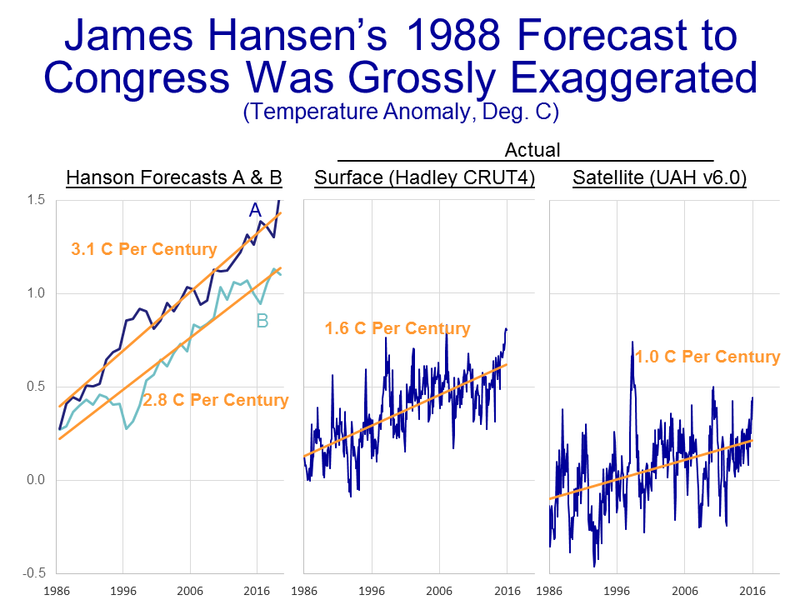 And that can only be proven over time, by comparing climate model output to actual weather. 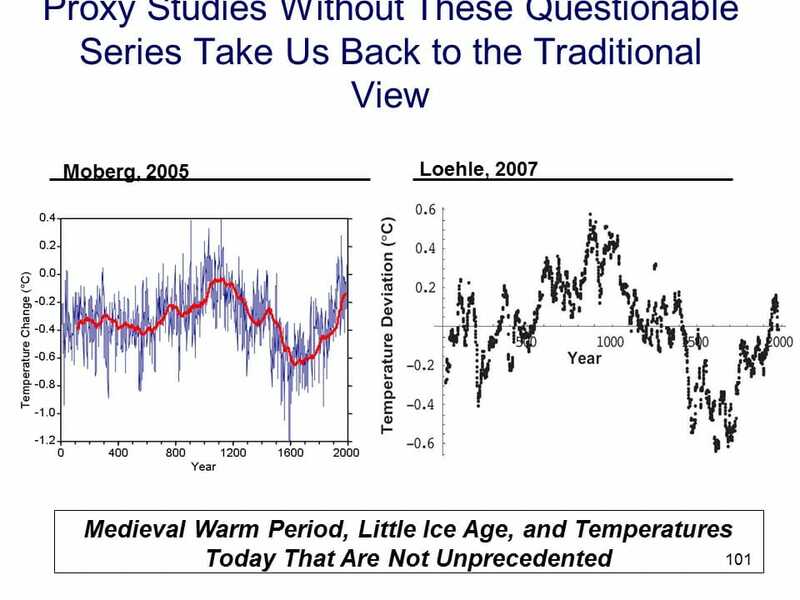 Back in chapter 4A, we briefly discussed how actual temperatures are in fact not tracking very well with climate model predictions, which should throw a substantial amount of doubt on the current quality of climate models (though the media still tends to treat model predictions as authoritative). In this section, we will focus on some of the natural factors that are missing from most climate models. 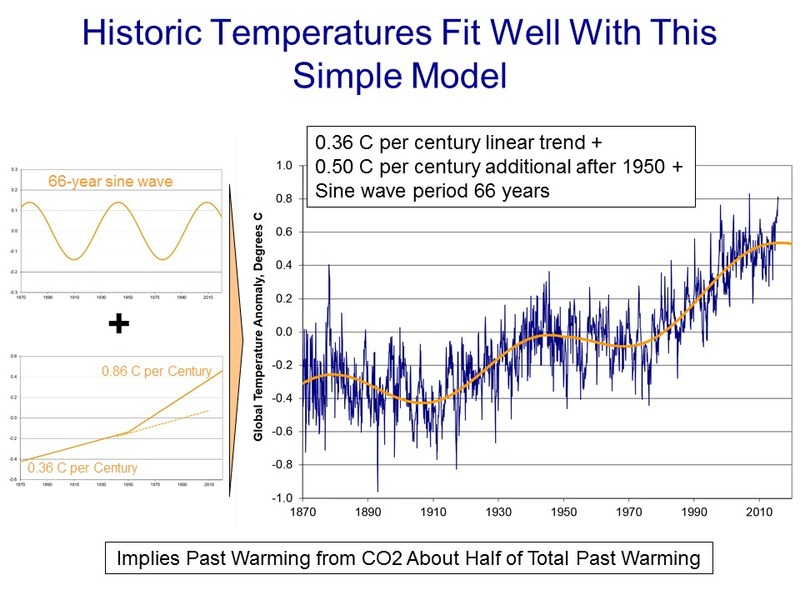 Obviously, if important natural drivers have been left out of the models, then one cannot conclude from the inability of the models to match historical warming that the historical warming couldn't have been natural. After discussing some of these factors, I will take my owns swing at the attribution problem. We will begin with long-term climate variations. These are most certainly left out of the models, because no one really understands why they occur (though theories abound, of course). 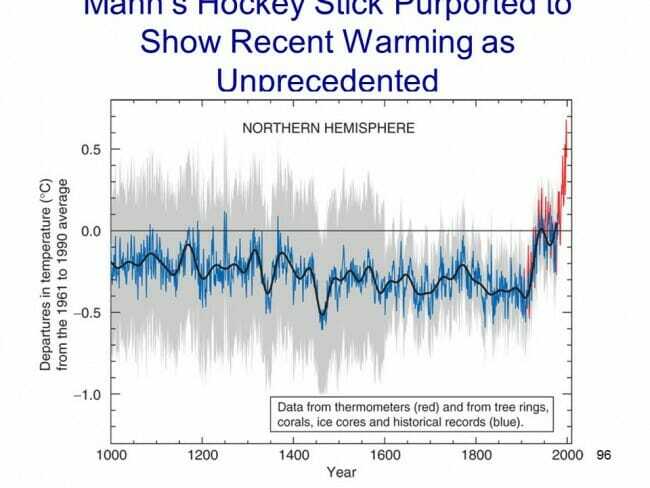 Mann's hockey stick not-withstanding, the consensus picture of past climate continues to include a strong warming period in the Middle Ages and a cool period, called the Little Ice Age, in the 16th and 17th centuries. Imagine you were a climate modeler in 1600. 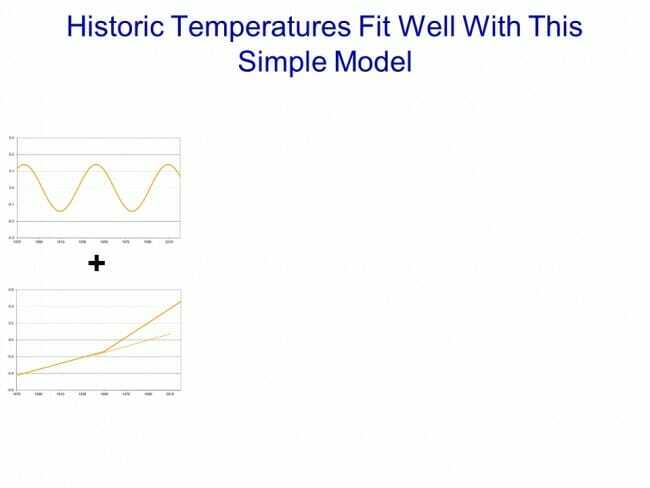 Your model would probably have under-predicted temperatures over the next 200 years, because you were trying to model starting at the bottom of a long-term cyclical trend. So clearly leaving this trend out in 1600 would get the wrong answer. Wouldn't leaving it out in the year 2000 also get the wrong answer? 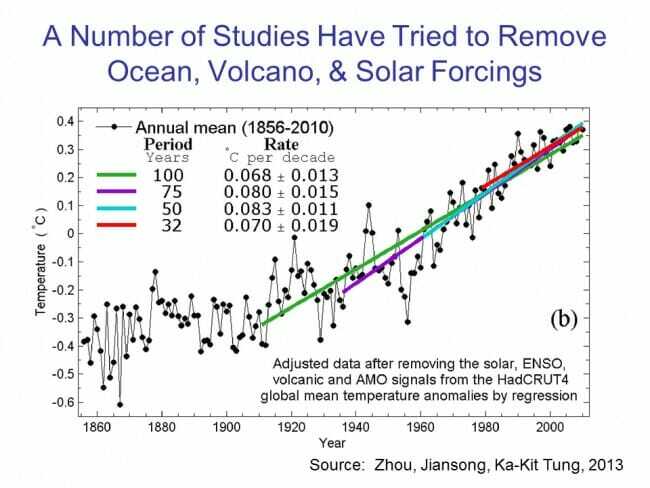 All too often scientists tend to assume (though not always explicitly) that this long-term natural recovery of temperatures ended around 1950, at the same time they believe man-made warming started. A metaphorical hand-off occurred from natural to man-made factors. But there is no evidence for this whatsoever. We don't know what caused the Little Ice Age, so we don't know how long it can last or when it ends. Since we have mentioned it, let's discuss the sun. The sun is the dynamo that, along with a few smaller effects like the rotation of the Earth, drives the climate. We have known for some time that the Sun experiences cycles of variation, and one of the ways one can observe this variation is by looking at sunspots. We have more sophisticated ways of measuring the sun today, but we still count the spots. Sunspots are cyclical in nature, and follow an eleven or so year cycle (you can see this in the spikes in the monthly light blue data above). But when one take this cycle out of the picture, as was done with the 10.8 year moving average above, there also appears to be longer cyclical trends. 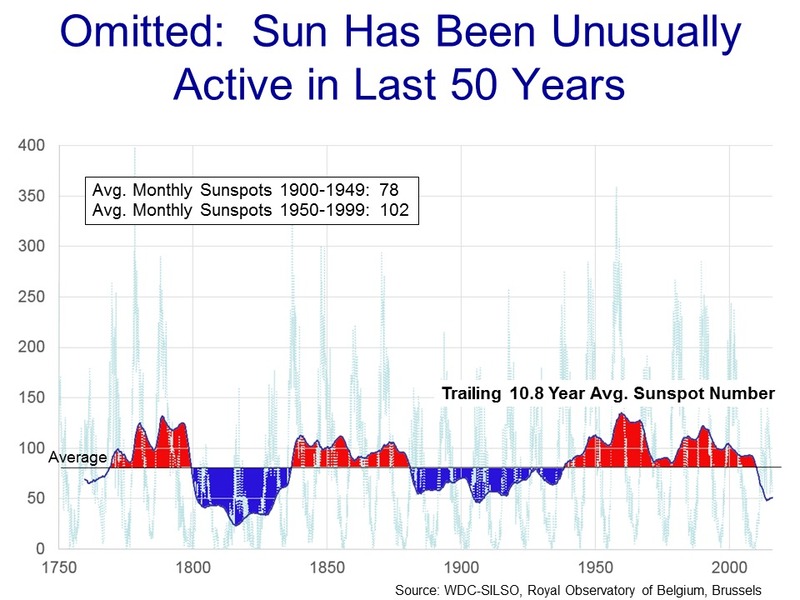 Since it is generally thought that more sunspots correlate with higher solar activity and output, one might expect that there could be some correlation between this solar trend and temperatures. 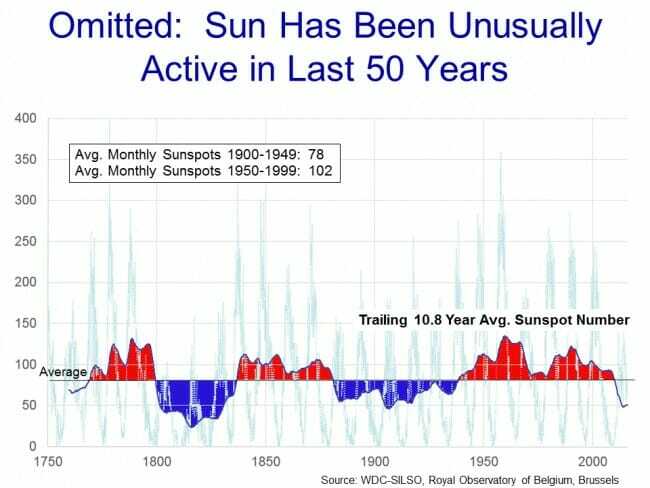 As we can see above, by the sunspot metric the sun was more active in the second half of the last century than in the first half. Today, we don't have to relay on just the spots, we can look at the actual energy output of the sun. And it turns out that the types of variations we have seen over recent decades in sunspots do not translate to very large changes in solar output on a percentage basis. Yes, there is more solar output but the extra amount is small, too small to explain much temperature variation. There is, though, an emerging new theory that a complex interaction of the sun with cosmic rays may affect cloud formation, acting as a multiplier effect on changes in solar output. A lot of skeptics, eager to support the natural causation argument, jumped on this theory. However, though the theory is intriguing and could turn out to be correct, I think folks are getting well ahead of the evidence in giving it too much credence at this point. At the end of the day, while solar variation may explain very long-cycle climate variations, it does not do much to explain our 1978-1998 warming period, so we will move on to another natural factor that does appear to have some explanatory power and which is also not in most climate models -- ocean cycles. 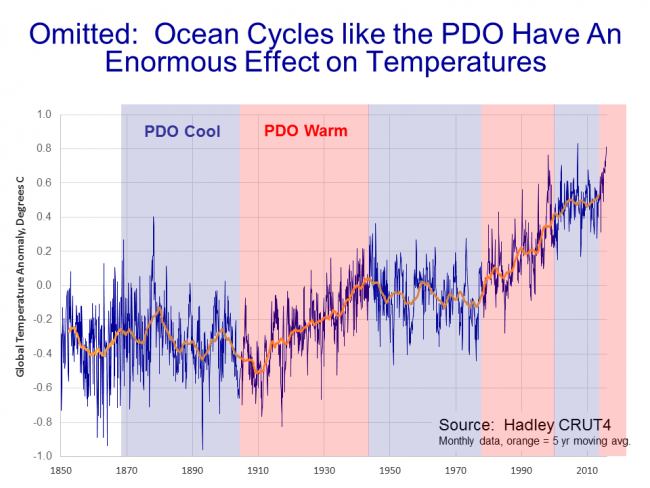 When the PDO has been in its warm phases (the red periods in the chart above), global temperatures rise. When it is in its cool phases (the blue zones), temperatures are flat to down. As you can see, the PDO was in a warm phase in our 1978-1998 period. 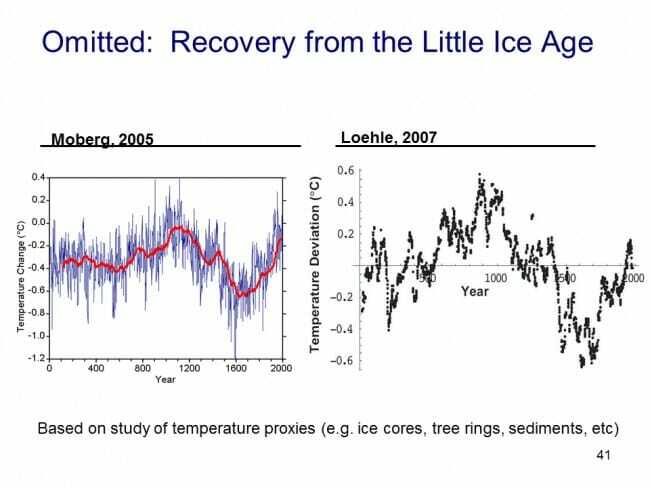 Surely some of that steep rise in temperature may have come from the effect of this ocean cycle, yet this cycle was not included in the climate models that supposedly ruled out the possibility of natural causes for warming in this period. With these natural effects removed, much of the cyclical variation from the Hadley CRUT4 data are gone, and we are left with a pretty constant linear trend. Aha! There is the warming signal, right? Well, yes, but there is a problem here for the effort to attribute most or all of this warming to man -- specifically, this is not at all the trend one would expect if the long-term trend were primarily from man-made CO2. Note the very linear trend starts around 1900, long before we began burning fossil fuels in earnest, and the trend is really quite flat, while man-made CO2 production has been growing exponentially. 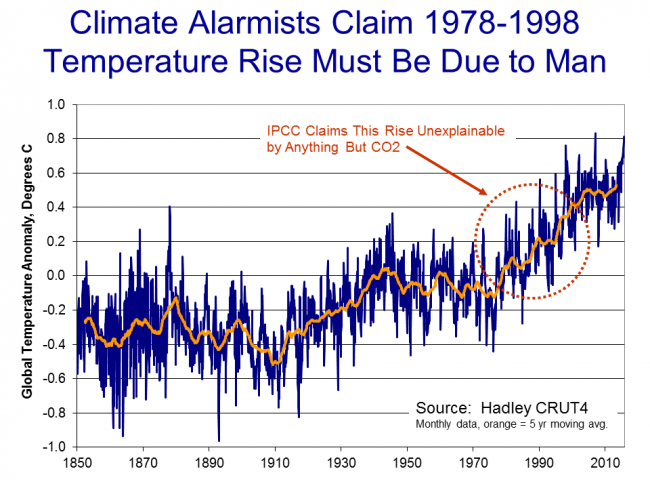 Supporters of man-made attribution are left in the uncomfortable position of arguing that there must have been natural warming until about 1950 which stopped just in time for man-made warming to take over. A number of years ago I decided to take a shot at the attribution problem, largely just for fun, but it turned out so well I still keep it up to date. I decided to assume just three factors: 1. A long term linear trend starting even before the 20th century, presumably natural; 2. A new added linear trend, presumably from man-made effects; and 3. A decadal cyclical factor, from things like ocean cycles. 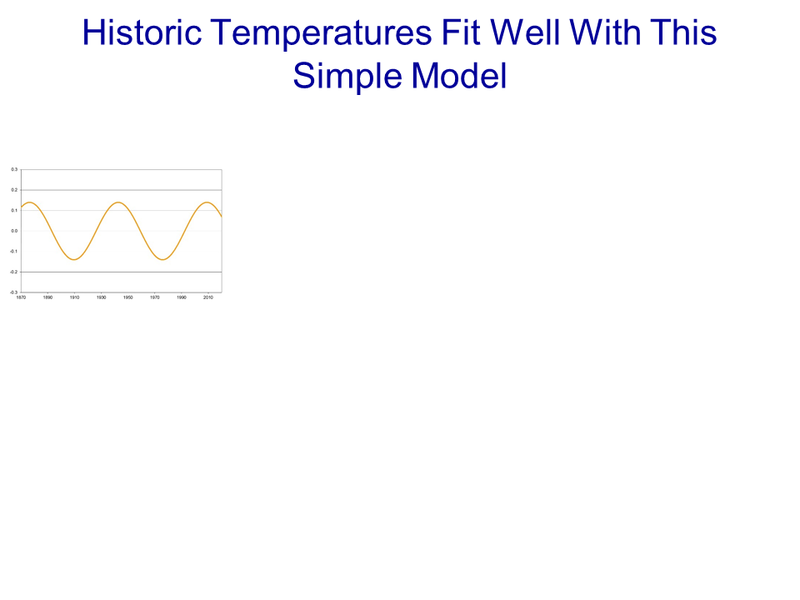 I let the optimization program control everything -- the slope of the linear trends, the amplitude and period of the cyclical factor, the start date of the second modern trend, etc, to get the best fit with historic temperatures. As before, I used monthly Hadley CRUT4 data. 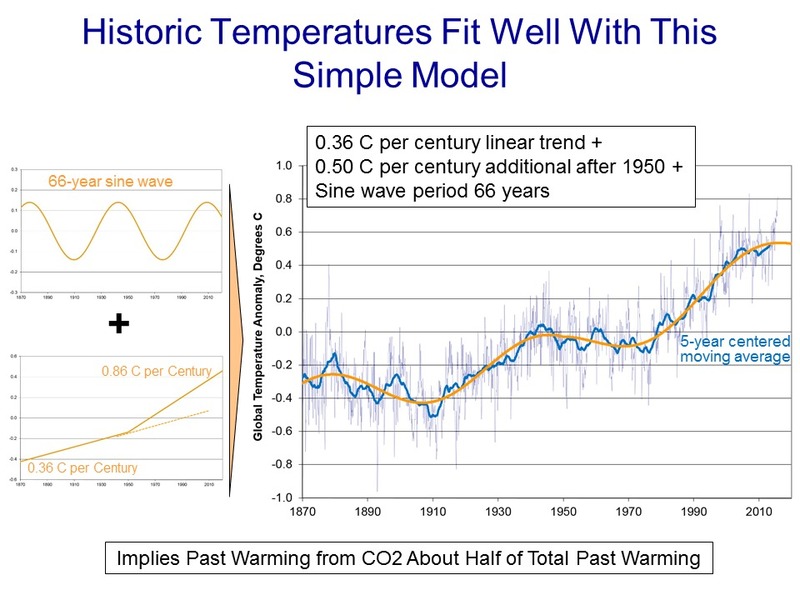 Plus a long-term linear trend of 0.36C per century and a new linear trend beginning around 1950 that adds another 0.5C per century (for a total linear trend after 1950 of 0.86C per century). That is, then, my solution to the attribution problem. 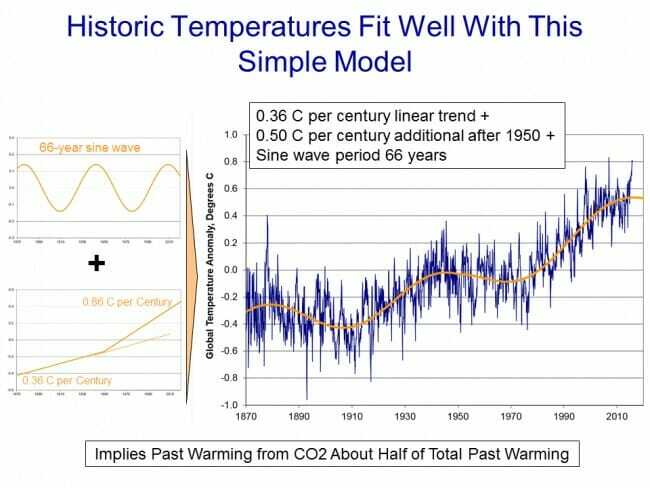 Take the 0.5C per century since 1950 that this model has as a modern linear trend, and we will for argument sake attribute it all to man. From 1950-2016 (66 years, coincidentally my sin wave period) that is 0.33C of historic warming due to man-made CO2. In the next chapter, we return to the climate forecasts we discussed in chapters 2 and 3 and ask ourselves whether these make sense in the context of past warming. Chapter 6 on climate forecasts vs. actual temperatures is here. In part A of this chapter, we showed that the world had indeed warmed over the past 30-100 years, whether you looked at the surface temperature record or the satellite record. Using either of these metrics, though, we did not see global warming accelerating, nor did we see warming rates that were faster than predicted. In fact, we saw the opposite. One story I left out of part A, because it did not affect the basic conclusions we drew, is the criticisms of the surface temperature record. In this part B, we will discuss some of these criticisms, and see why many skeptics believe the 0.8C warming number for the past century is exaggerated. We will also gain some insights as to why the satellite measured warming rates may be closer to the mark than rates determined by surface temperature stations. That is the temperature station, around that fenced in white box (the uproar over this picture eventually caused this location to be closed). It was in the middle of a parking lot in the middle of a major university in the middle of a growing city. 100 years ago this temperature station was in the countryside, in essentially the open desert - no paving, no buildings, no cars. So we are getting the highest warming rates in the country by comparing a temperature today in an asphalt parking lot in the middle of a city to a temperature a hundred years ago in the open desert. The problem with this is what's called the urban heat island effect. Buildings and concrete absorb heat from the sun during the day, more than would typically be absorbed by raw land in its natural state. 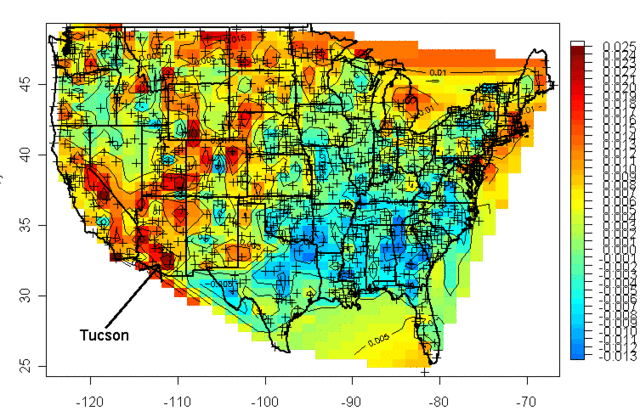 This heat is reradiated at night, causing nights to be warmer in cities than in the areas surrounding them. If you live in a city, you will likely hear weather reports that predict colder temperatures in outlying areas, or warn of freezes in the countryside but not in the city itself. 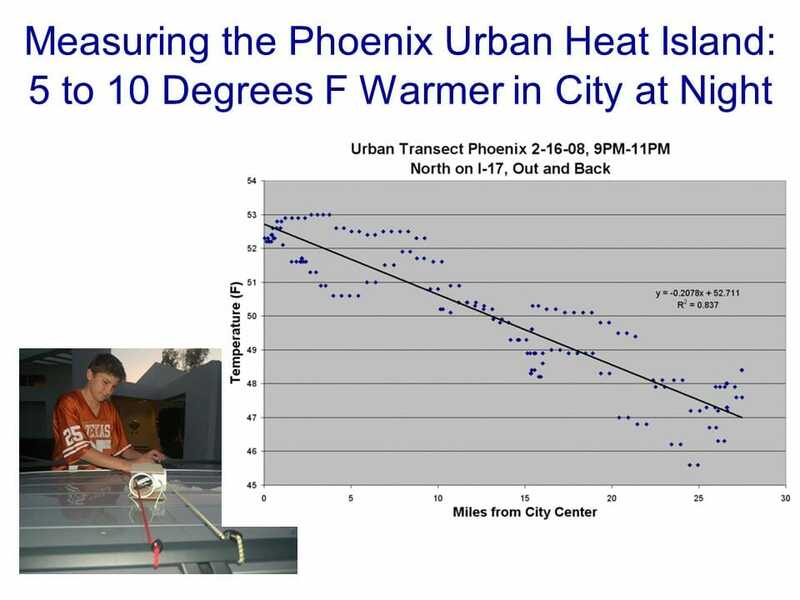 It turns out that this urban heat island effect is easily measured -- it even makes a great science fair project! My son and I did this project years ago, attaching a small GPS and temperature probe to a car. We then drove out of the city center into the country and back in the early evening, when the urban heat island effect should be largest. We drove out and then back to average out any effects of overall cooling during our testing. One of the trips is shown above, with around 6 degrees F of temperature change. We, and most others who have done this in other cities, found between 5 and 10 degrees of warming as one drives into a city at night. If this effect were constant over time, it would not pose too many problems for our purposes here, because we are looking at changes in average temperatures over time, not absolute values. 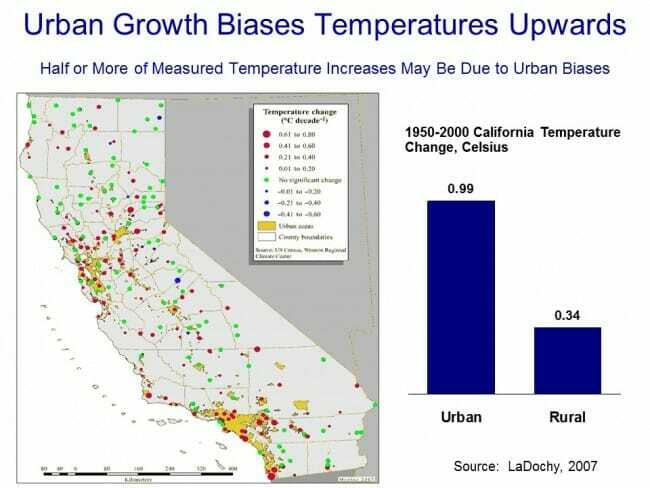 But the urban heat island warming of a city (and particular temperature stations) increases as the urban area grows larger. Because this urban warming is many times the global warming signal we are trying to measure, and since most temperature stations are located near growing urban locations, it introduces an important potential bias into measurement. Anthony Watt has been working for years to do this same analysis for the entire US. 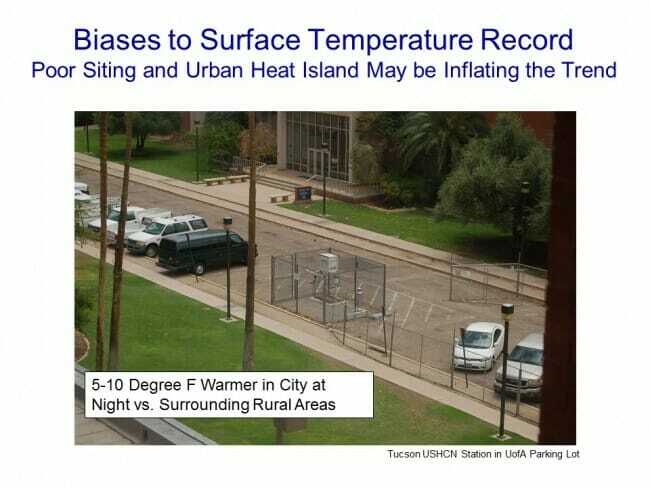 In fact, the pictures taken above of the temperature station in Tucson were part of the first phase of his project to document each USHCN site used in the global warming statistics with pictures. 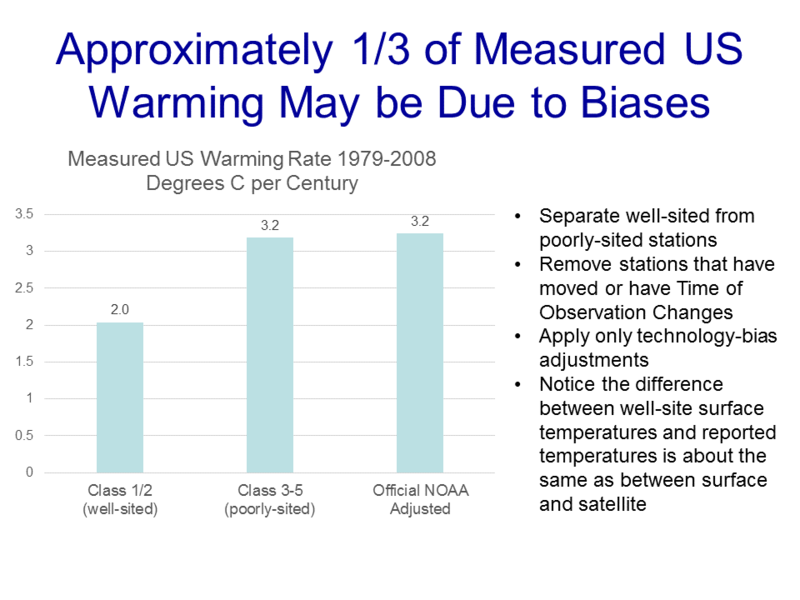 Once he had pictures, he compared the details of the siting with a classification system scientists use to measure the quality of a temperature sites, from the best (class 1) to the worst with the most biases (class 5). He found that perhaps a third of the warming in the official NOAA numbers may come from the introduction of siting biases from bad sites. Or put another way, the warming at well-sited temperature stations was only about 2/3 in the official metric. By the way, this is one other reason why I tend to favor the satellite measurements. Going back to the numbers we showed in part A, the satellite temperature metric had about 2/3 the trend of the surface temperature reading, or almost exactly what the surface readings would be if this siting bias were eliminated (the absolute values of the trends don't match, because they are for different time periods and different geographies). There is one other aspect of this chart that might have caught your eye -- if some temperature stations are showing 2 degrees of warming and some 3.2 degrees of warming, why is the total 3.2 degrees of warming. Shouldn't it be somewhere in the middle? One explanation is that the NOAA and other bodies take the data from these stations and perform a number of data manipulation steps in addition to a straight spatial averaging. One such step is that they will use a computer process to try to correct temperature stations based on the values from neighboring stations. The folks that run these indices argue that this computational process overcomes the site bias problem. 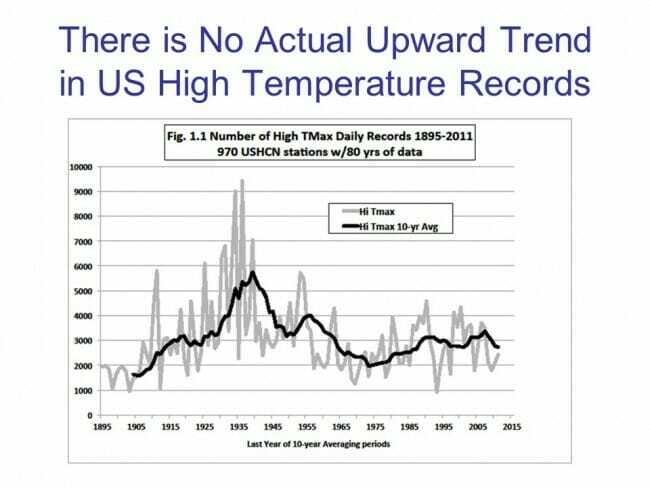 Skeptics will argue that this approach is utter madness -- why work to correct a known bad temperature point, why not just eliminate it? If you have a good compass and a bad compass, you don't somehow mathematically average the results to find north, you throw out the bad one and use the good one. In short, skeptics argue that this approach does not eliminate the error, it just spreads the error around to all the good stations, smearing the error like peanut butter. Here is an example from the GISS, using station data that has only been adjusted for Time of Observation changes (TOBS). You can see that Tucson has been adjusted down a degree or two, but Grand Canyon has been adjusted up a degree or two (with the earlier mid-century spike adjusted down). 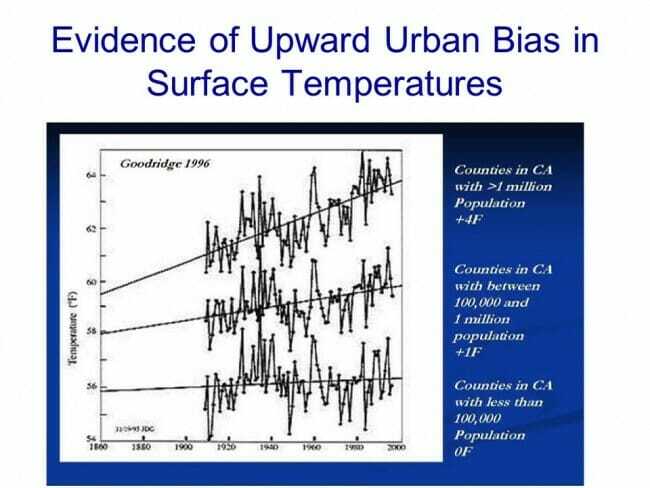 OK, so it makes sense that Tucson has been adjusted down, though there is a very good argument to be made that it should be been adjusted down more, say by at least 3 degrees. But why does the Grand Canyon need to be adjusted up by about a degree and a half? What is currently biasing it colder by 1.5 degrees, which is a lot? One suspects the GISS is doing some sort of averaging, which is bringing the Grand Canyon and Tucson from each end closer to a mean -- they are not eliminating the urban bias from Tucson, they are just spreading it around to other stations in the region. Nothing is less productive, to my mind, than when skeptics yell the word "fraud!" on the issue of temperature adjustments. 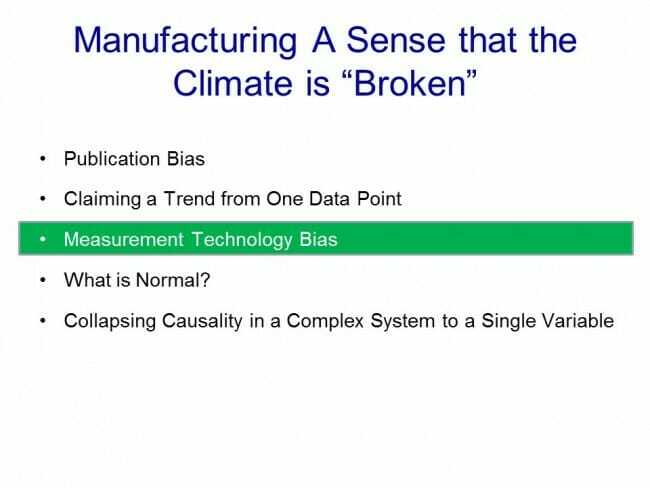 All temperature databases include manual adjustments, even the satellite indices that many skeptics favor. As mentioned above, satellite measurements have to be adjusted for orbital decay of the satellites just as surface temperature measurements have to be adjusted for changes in the daily time of observation. We may argue that adjustment methodologies are wrong (as we did above with urban biases). 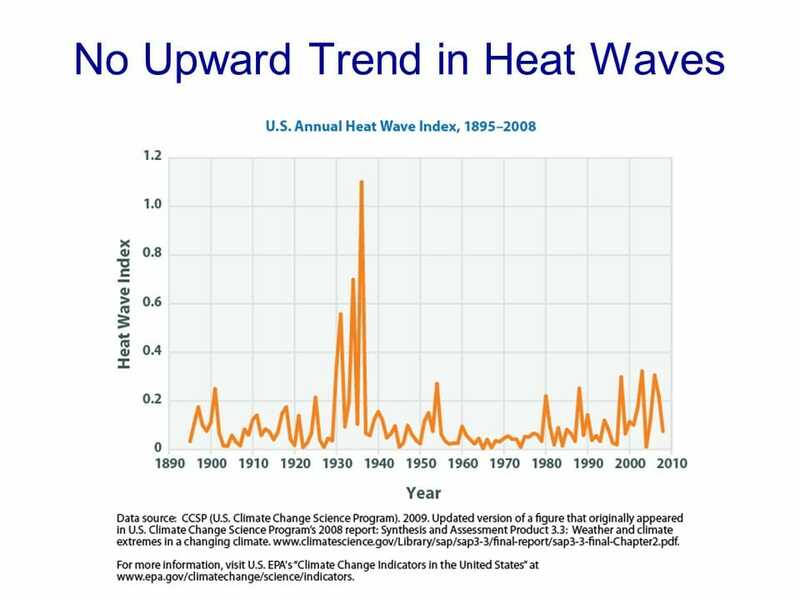 We may argue that there are serious confirmation biases (nearly every single adjustment to every temperature and sea level and ocean heat database tends to cool the past and warm the present, perhaps reinforced by preconceived notions that we should be seeing a warming signal.) But I find that charges of fraud just cheapen the debate. In this first example, we show the raw data (with Time of Observation adjustments only) in orange, and the final official adjusted version in blue. The adjustments triple the warming rate for the last century. 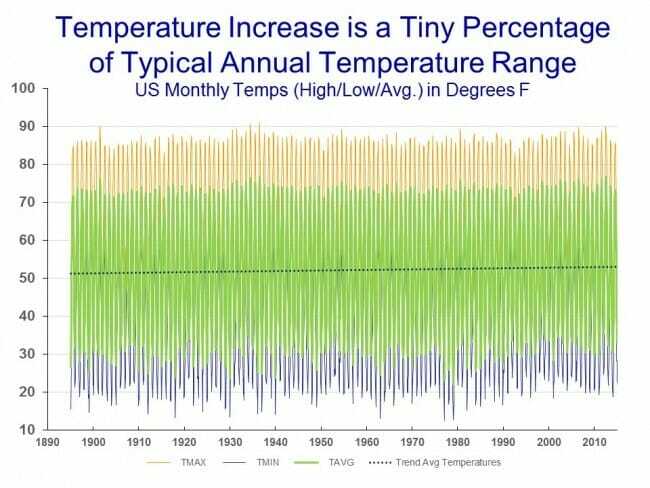 We can see something similar for the whole US, as raw temperature measurements (this time before time of observation adjustments) actually shows a declining temperature trend in the US. 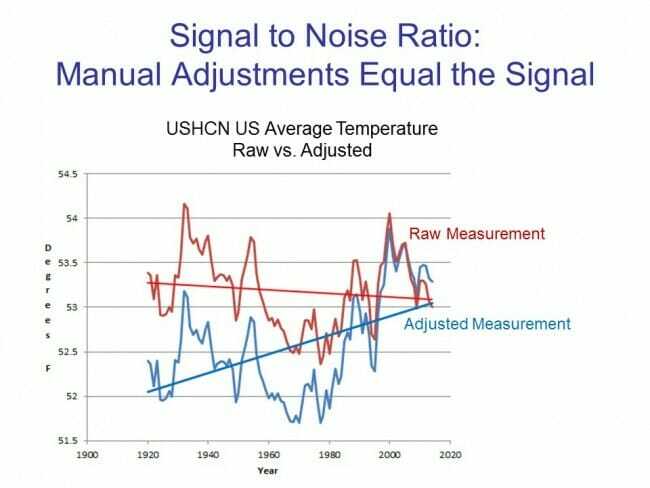 In this case, the entirety of the global warming signal, and more, comes from the manual adjustments. Do these adjustments (literally thousands and thousands of them) make sense when taken in whole? Does it make sense that there was some sort of warming bias in the 1920's that does not exist today? This is certainly an odd conclusion given that it implies a bias exactly opposite of the urban heat island effect. 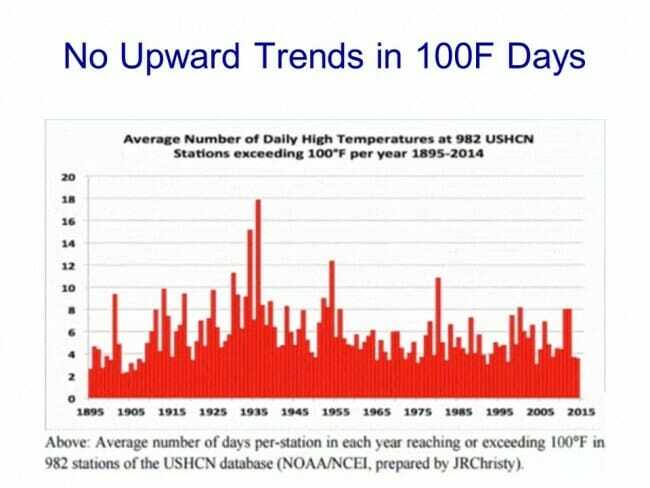 We could go into much more detail, but this gives one an idea of why skeptics prefer the satellite measurements to the surface temperature record. Rather than endlessly working to try to get these public agencies to release their adjustment details and methodology for third party validation to the public that pays them (an ongoing task that still has not been entirely successful), skeptics have simply moved on to a better approach where the adjustments (to a few satellites) are much easier to manage. Basically, water has a MUCH higher heat carrying capacity than air, and over 90% of any warming should be going into oceans. We are just starting to get some new tools for measuring the changes to ocean heat content, though the task is hard because we are talking about changes in the thousandths of a degree in the deep oceans. After this brief digression into the surface temperature records, it is now time to get back to our main line of discussion. 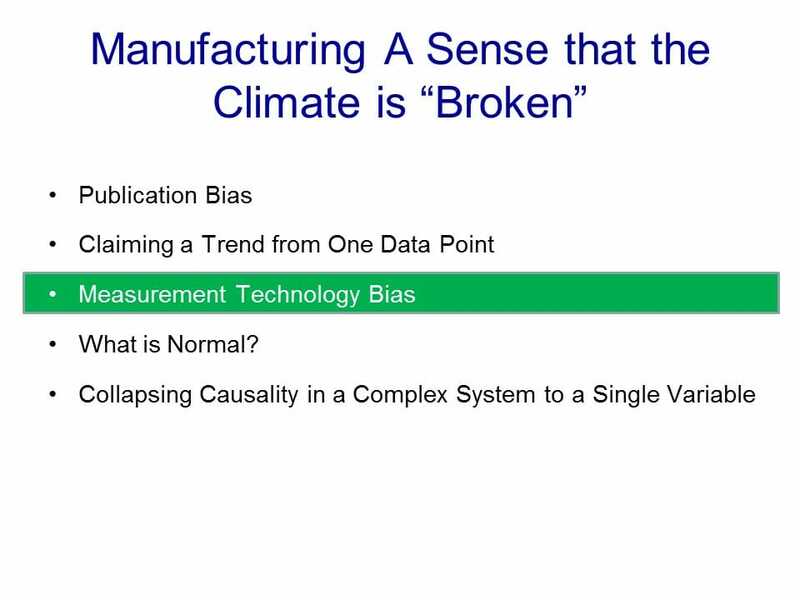 In the next chapter, we will begin to address the all-important attribution question: Of the warming we have seen in the past, how much is man-made? Chapter 5, Part A on the question of attributing past warming to man is here.